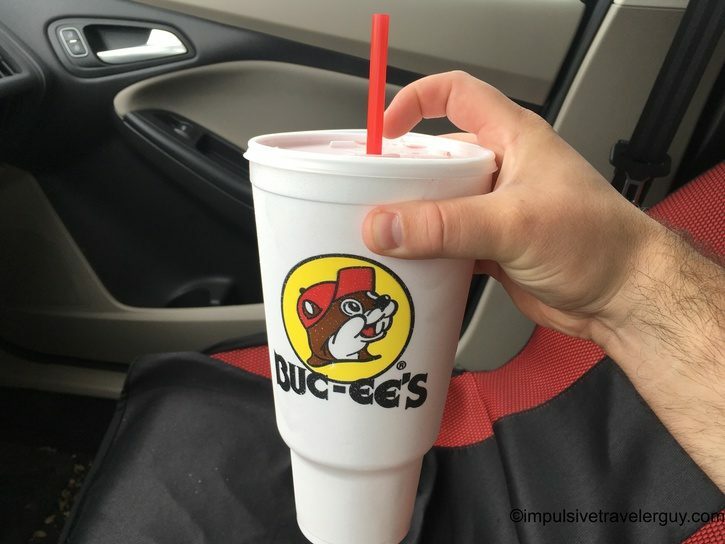 Everything’s bigger in Texas. I know you’ve heard that before. 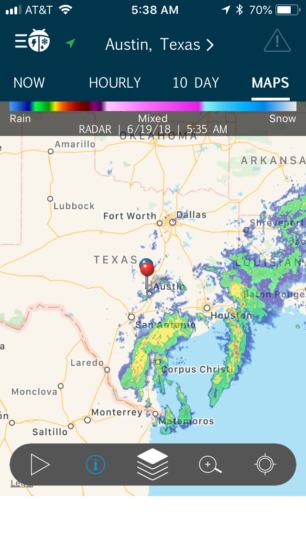 Texas has a way of taking things to the next level. 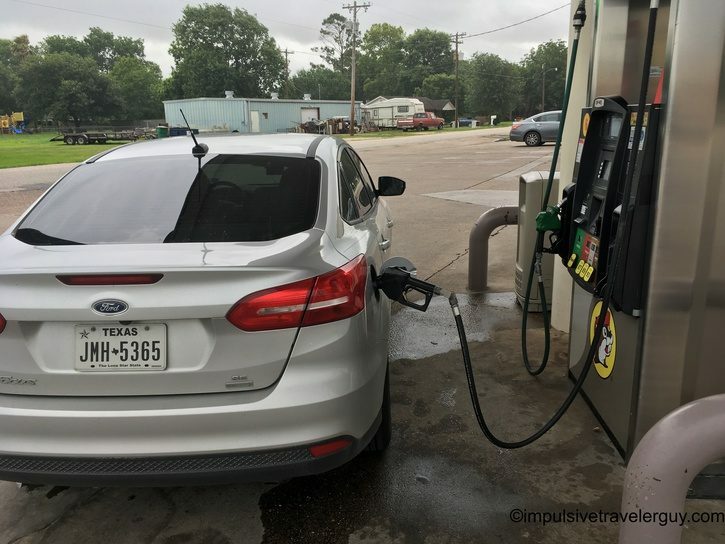 The average gas station is just a blip on the map. 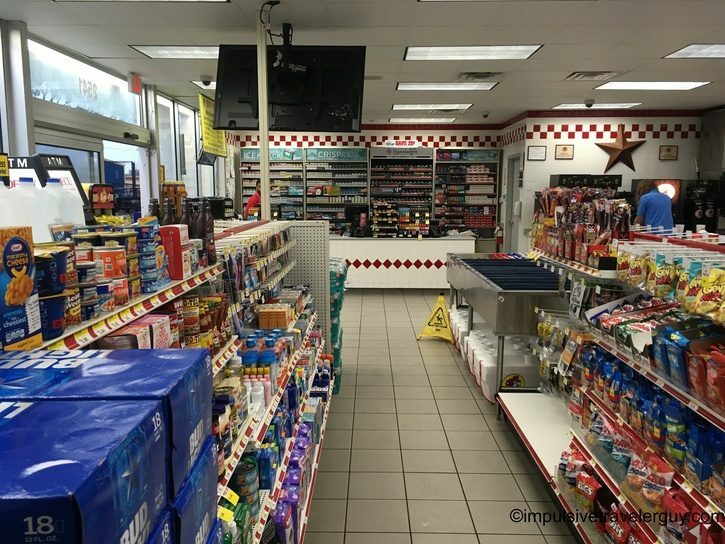 It’s a simple place to get gas and maybe a few snacks. 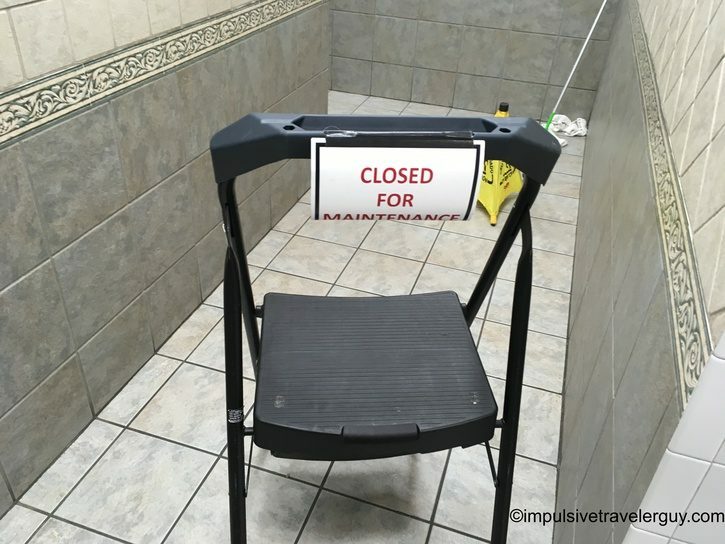 If you’re lucky there will be a clean restroom to use. The whole experience will be as memorable as brushing your teeth in the morning. 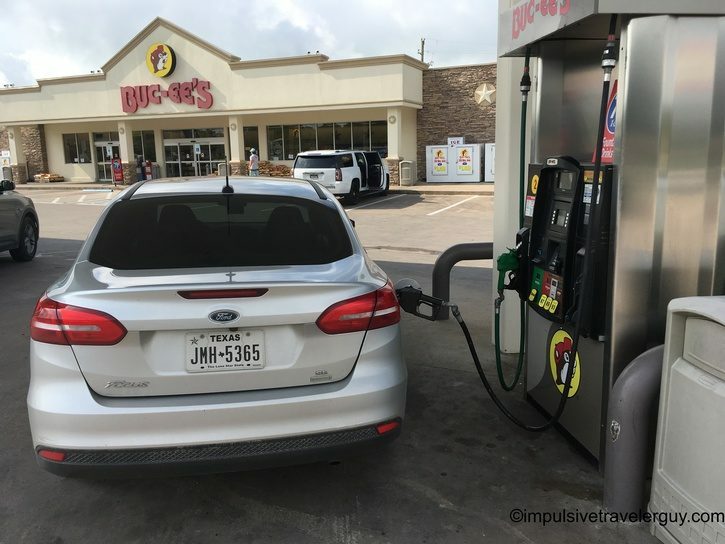 While your typical gas station experience is boring, leave it to Buc-ee’s to take it up a few notches. 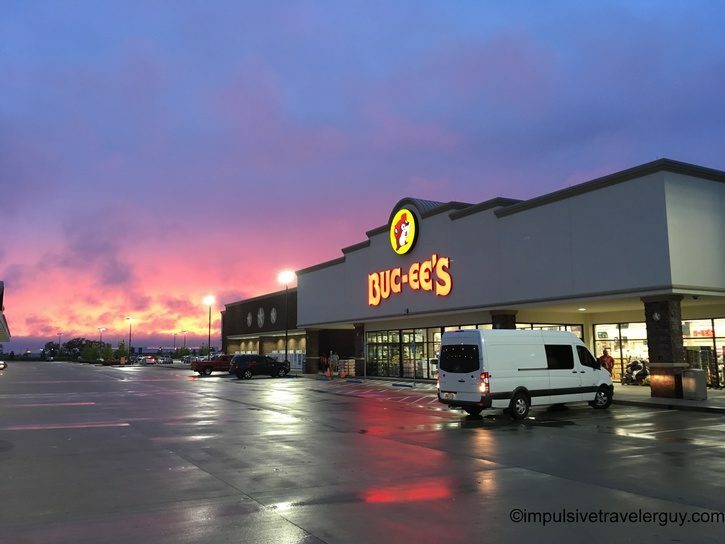 They may call Dairy Queen the “Texas Stop Sign,” but Buc-ee’s is the Texas Rest Stop. 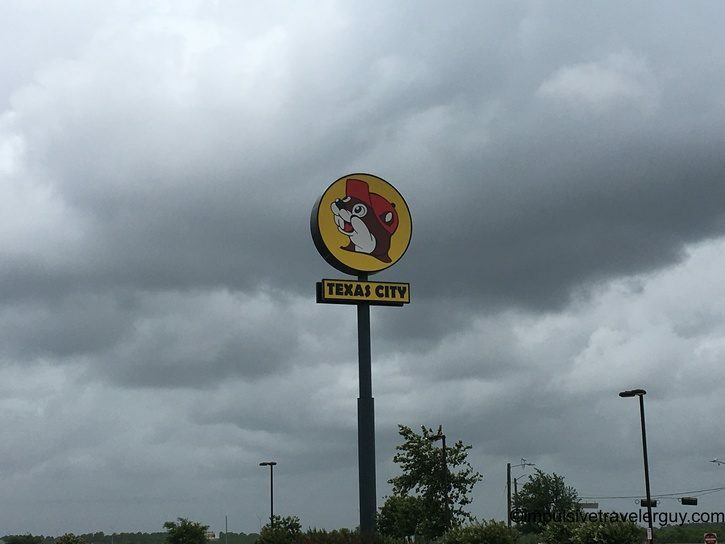 Buc-ee’s embraces that Texan pride and puts itself in a league of its own. 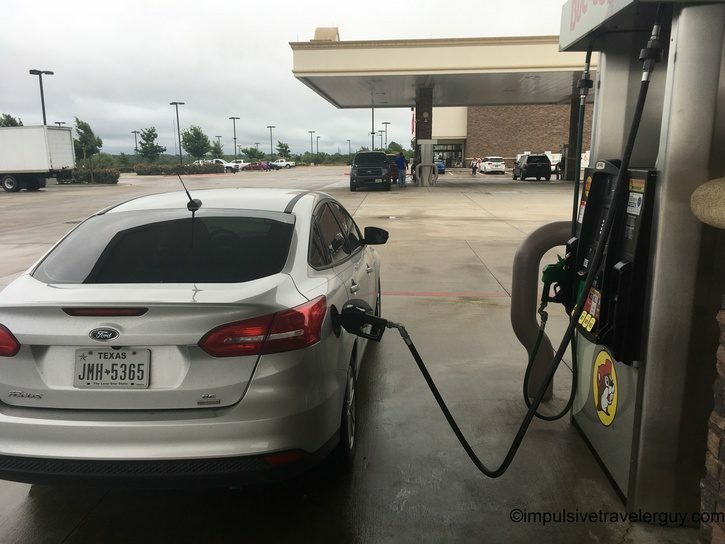 It’s such in a league of its own that its New Braunfels location is the largest gas station in the world. 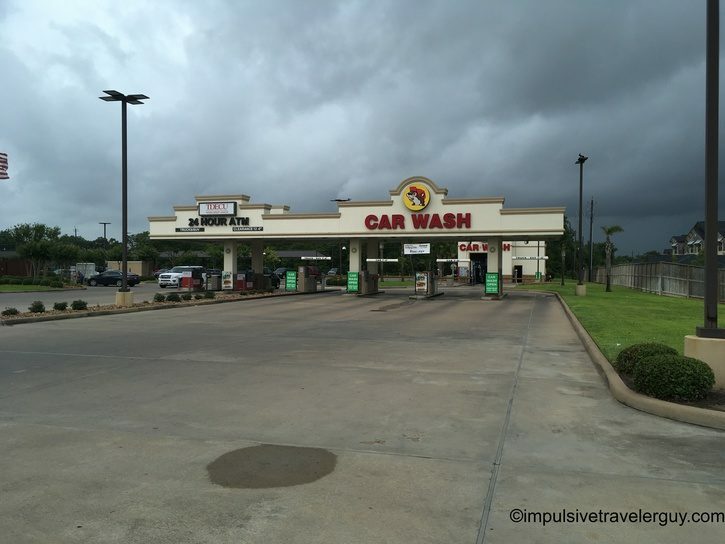 The Katy location holds the world record for longest car wash.
I’ve blogged about Buc-ee’s before, but the brand has always intrigued me. If there’s one in the area, it’s one of my go-to stops. 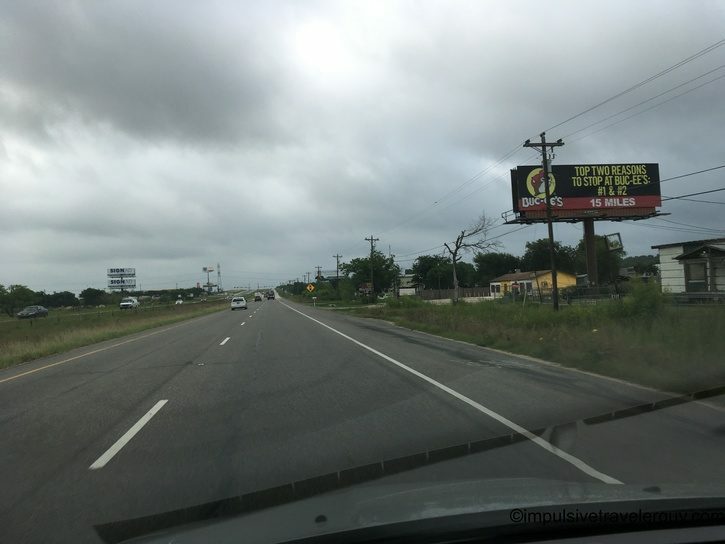 You will often see billboards advertising the nearest Buc-ee’s away. In some cases it can be 75+ miles! 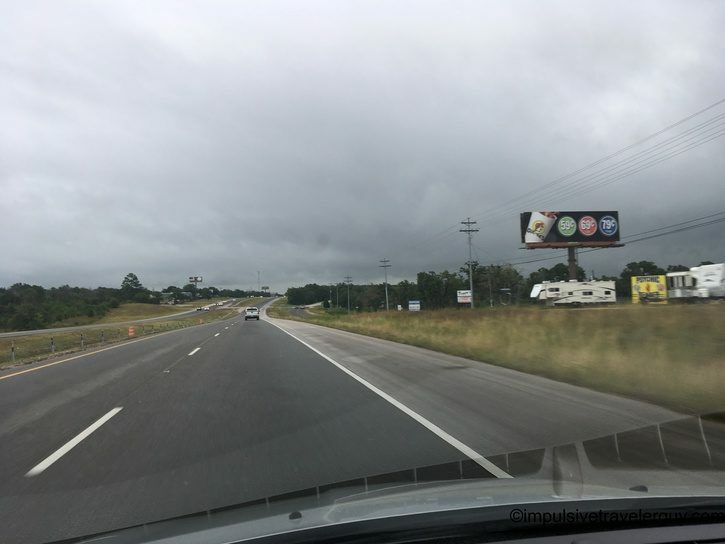 You will usually see more billboards along the way, but the most important one is knowing which exit to take. 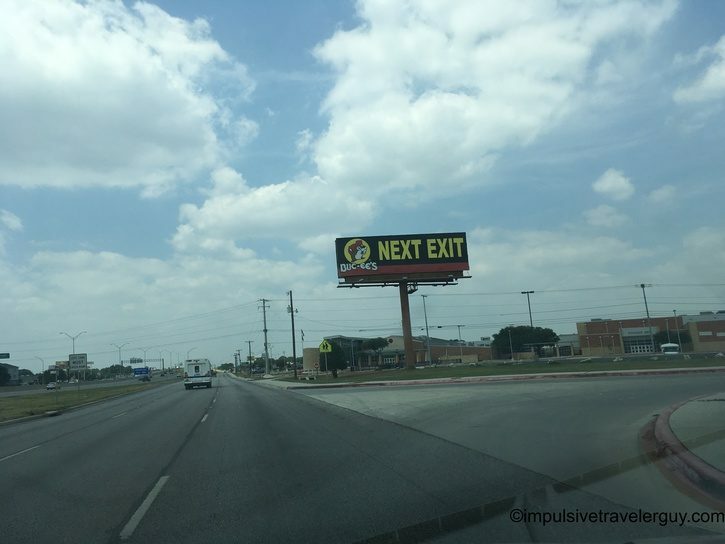 There’s usually a big “exit now” billboard. 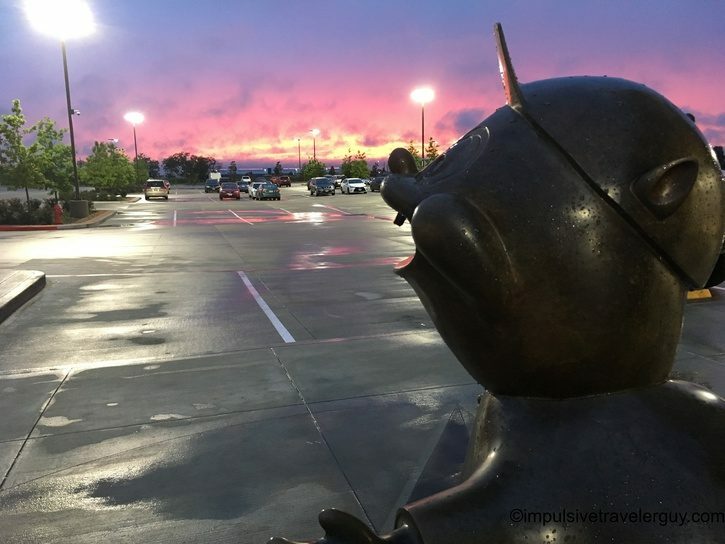 Buc-ee’s isn’t just a gas station. 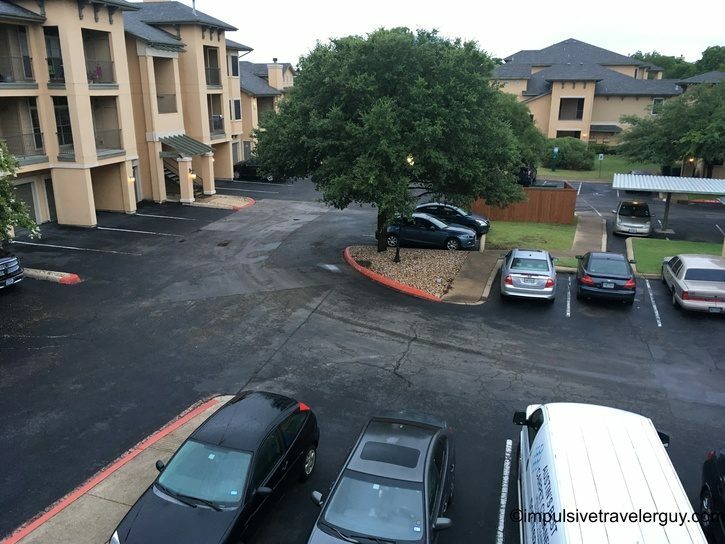 It’s really a destination that adds more character to any road trip. They also boast the cleanest bathrooms around. 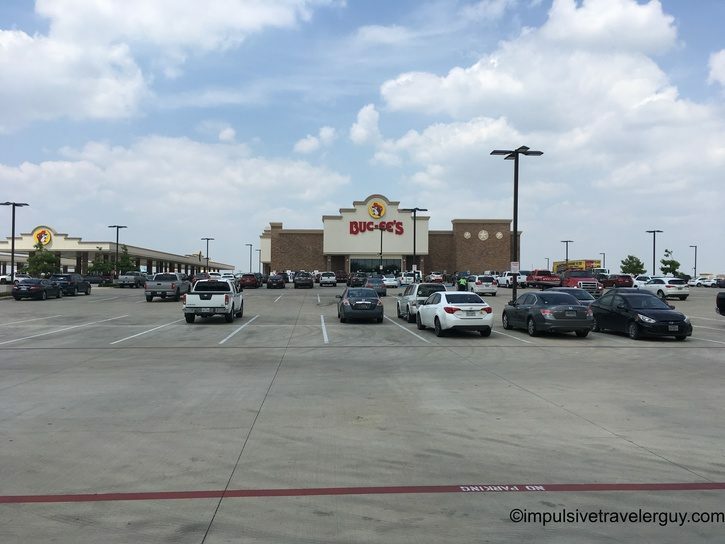 Being that Buc-ee’s is a destination in itself, I decided to hit up every single one in Texas. That’s right! 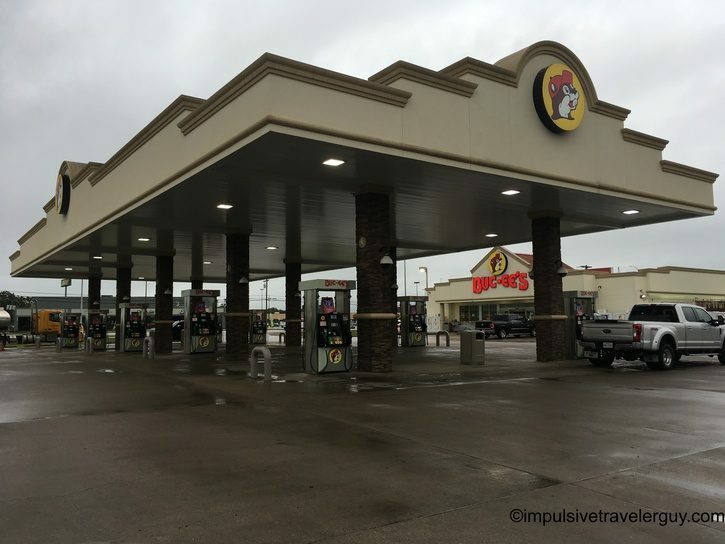 I literally drove around 1,600 miles just to visit all 33 Buc-ee’s gas stations in Texas. Reading the name of this blog, you know I’m impulsive by nature. 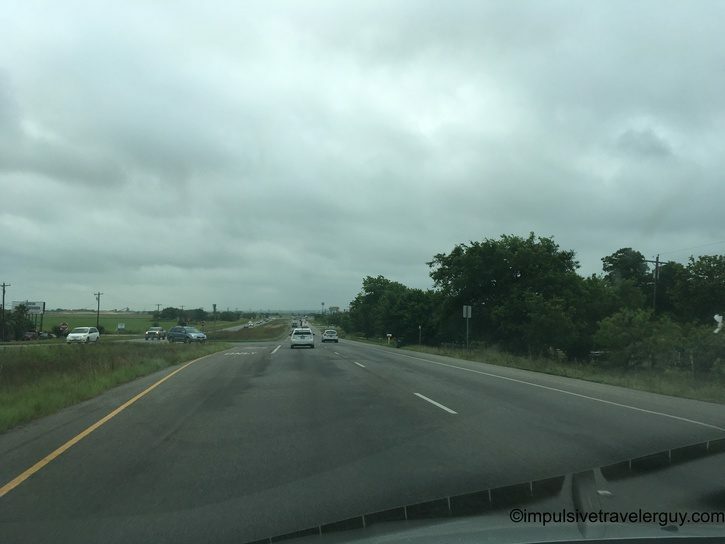 I’m not the biggest planner when it comes to road trips. 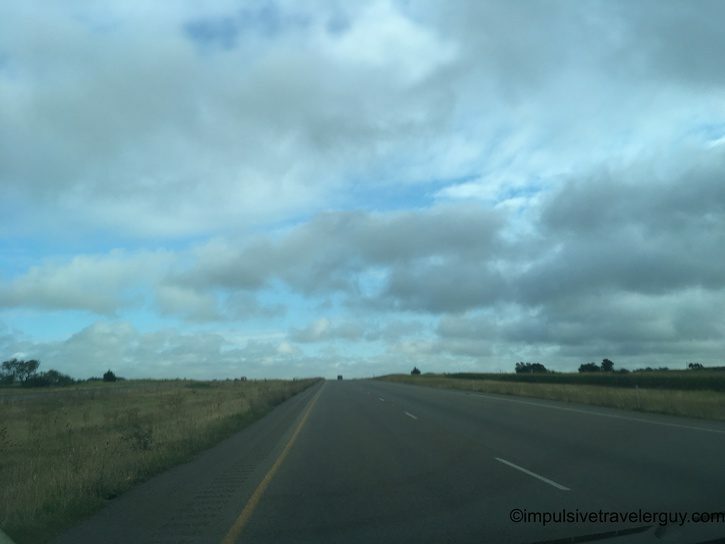 I really just thought of this road trip about a week prior to taking it. 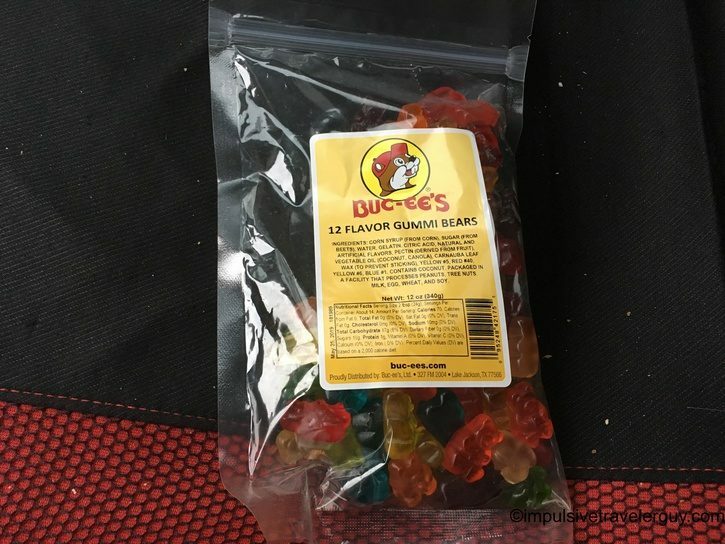 Considering there’s 33 Buc-ee’s in Texas, I had to do a little planning. 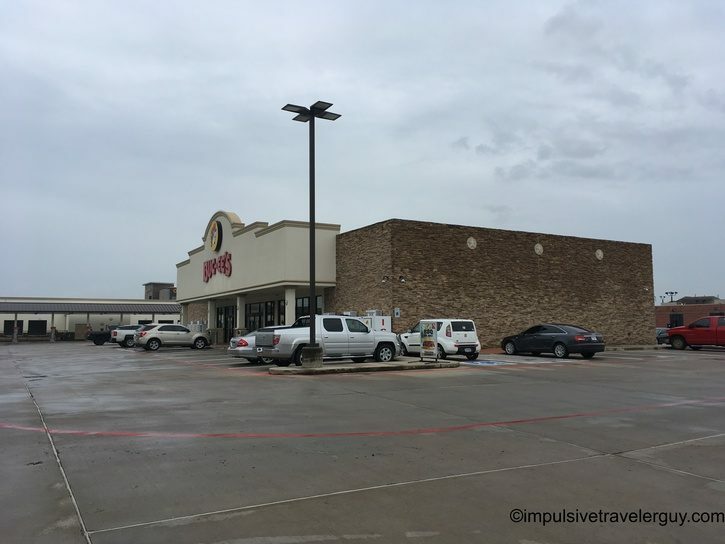 I took all the addresses of the Buc-ee’s from their website and punched them into a route optimizer. 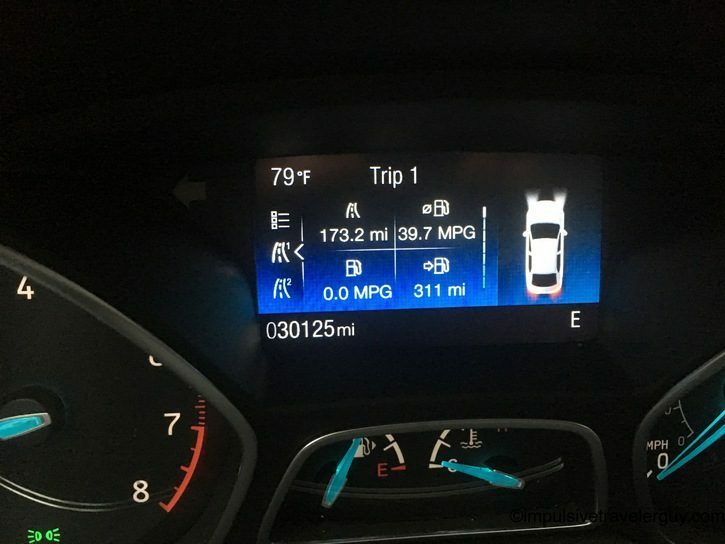 It calculated I would have around 30 hours of just driving. I knew I’d have to stretch it over a few days. I brought out my project management skills and the good ole y = mx + b. I broke it up over three days and then had my list of locations to visit. 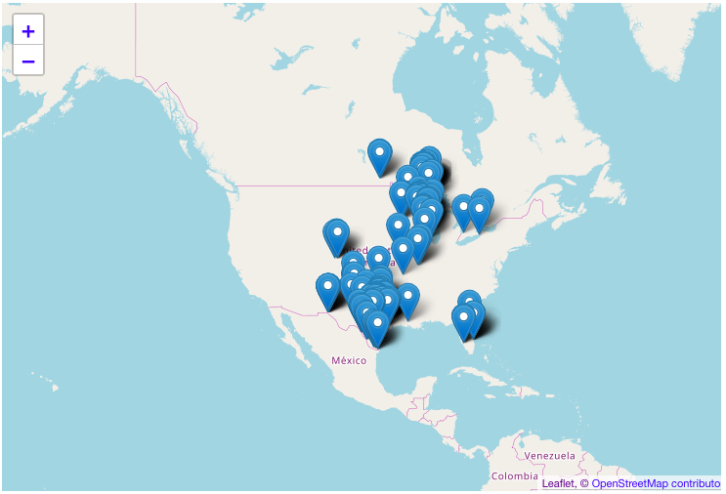 If you want to skip ahead and read about each location click on the list of locations or the map below that. Below the map is the rest of my story. I’m glad you’re still with me after that long list. I can tell you it was a heck of a drive! 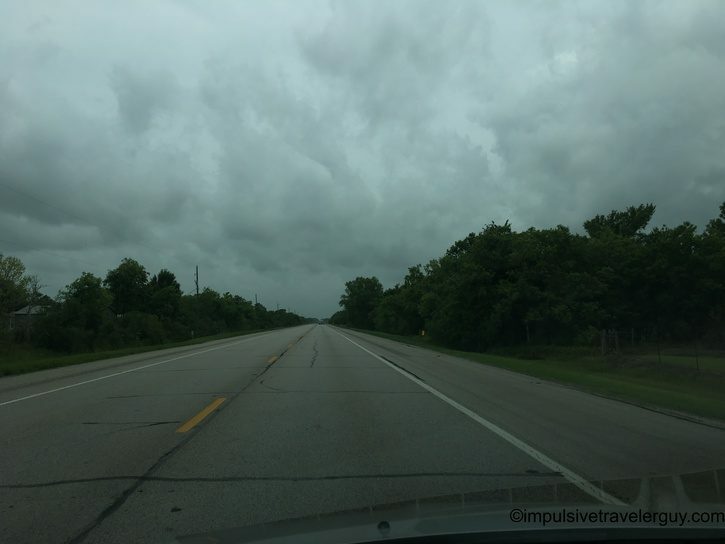 I got to see some nasty weather along the way. I also got to be a bit sketchy along the way. Usually this is reserved for border crossings, but this time it was via my credit card. 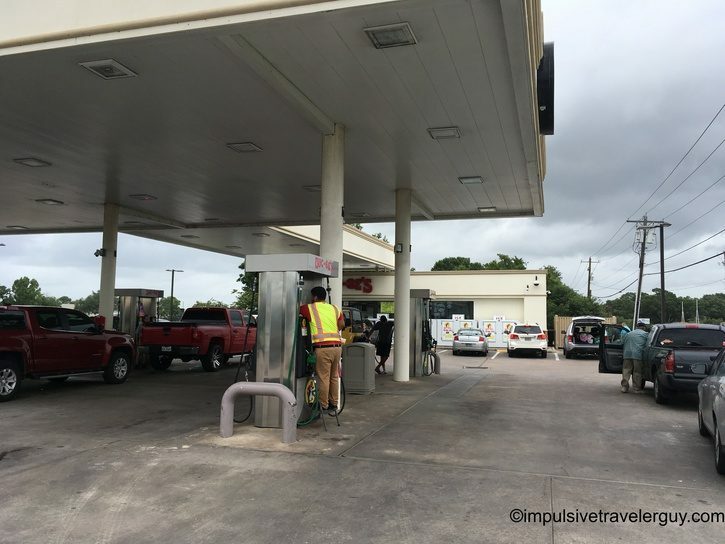 After visiting about a dozen Buc-ee’s the fraud alert was going nuts and it was getting declined. I mean, you know every credit card thief takes steals the card and then proceeds only to use it at a single chain. I decided the first day I’d head north. This was on June 19th. 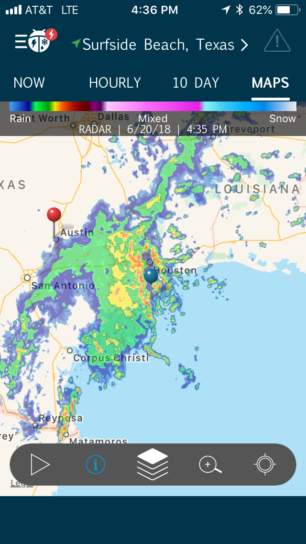 Judging by the radar and just a quick look outside, it was going to be a wet day. 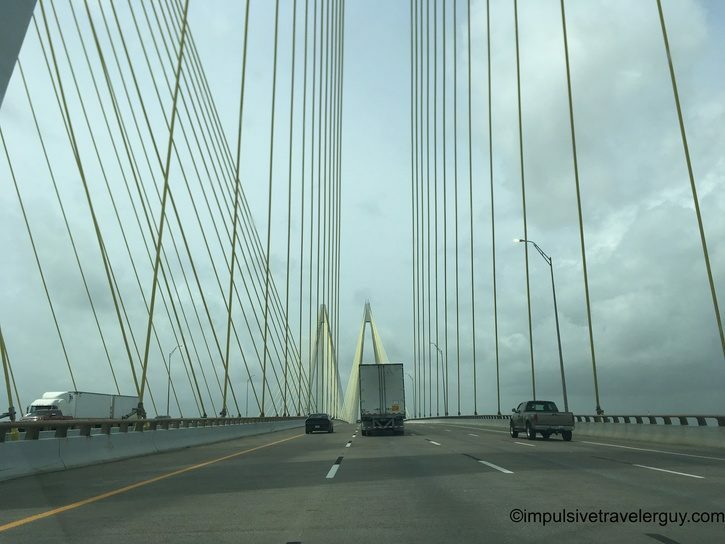 I got in the Focus and started my trip. 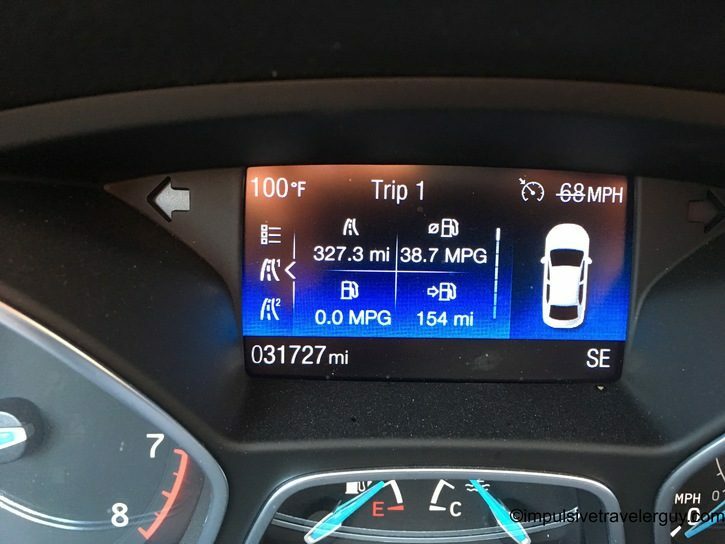 When I started, I had 30,125 miles on the car. Knowing I had a lot of driving, I drank a bunch of coffee to wake up. 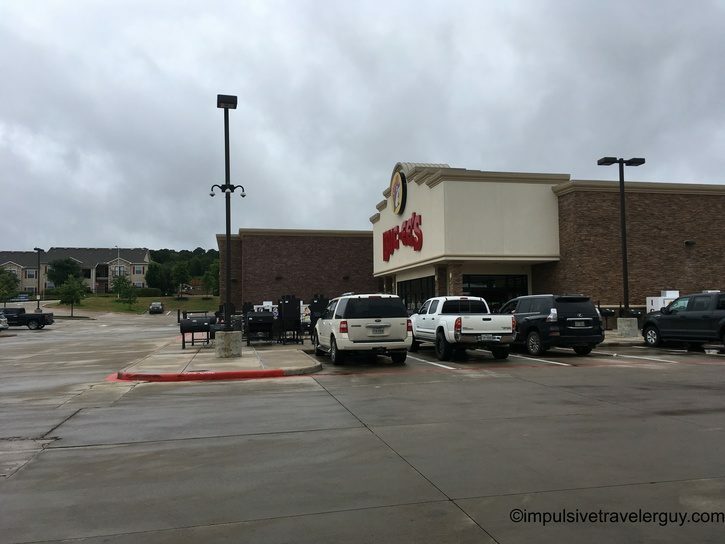 While the Buc-ee’s signs tell me I can hold it, I decided not to. 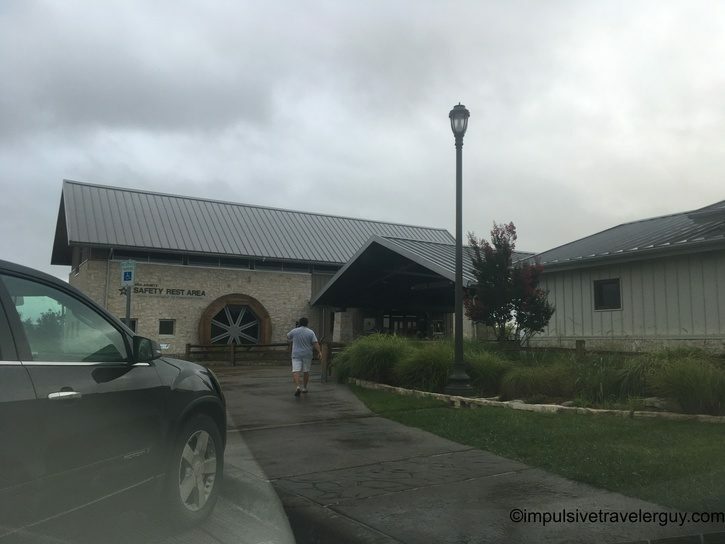 I stopped at the Bell County rest area. 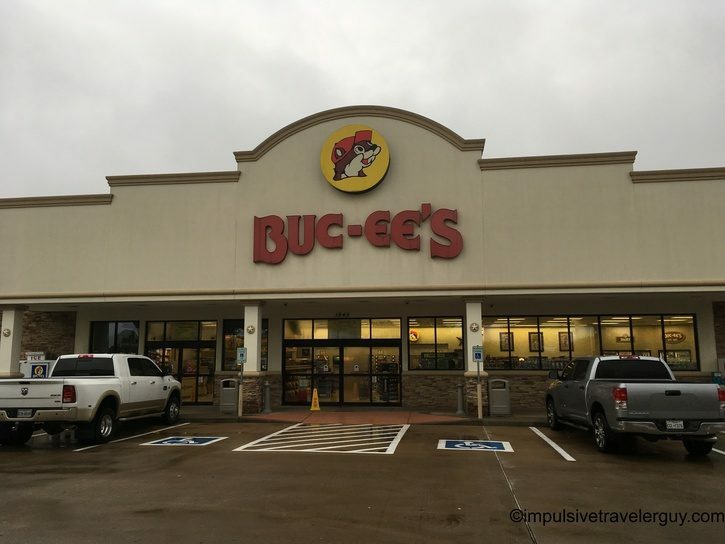 I quickly hit the road and the first Buc-ee’s was in site. This would be the Temple location. 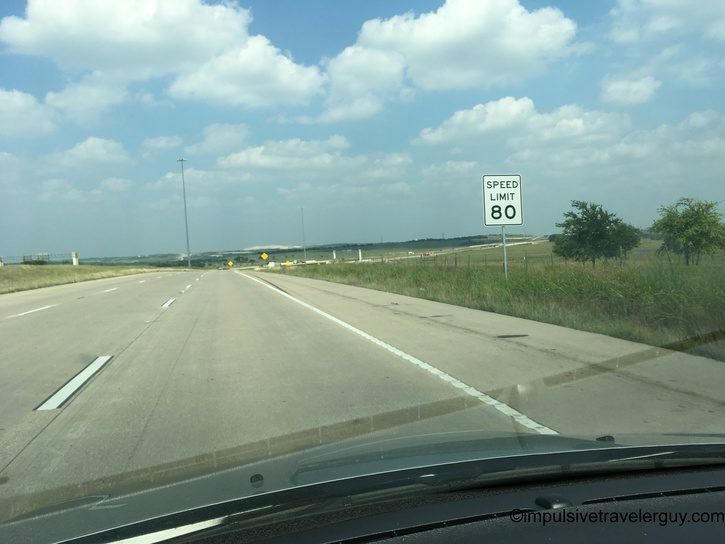 Since I drive I35 north to Wisconsin all the time, this is one of the ones I personally frequent the most. 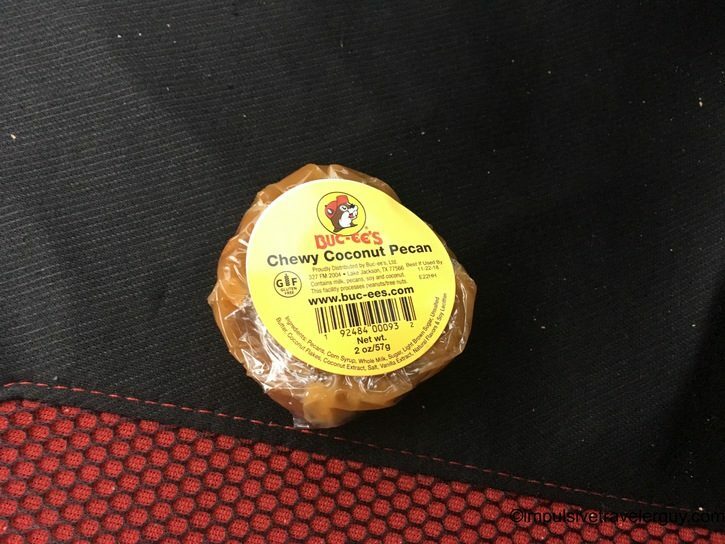 Now I made it a point to buy something at every Buc-ee’s. I made sure to take a bunch of pictures. 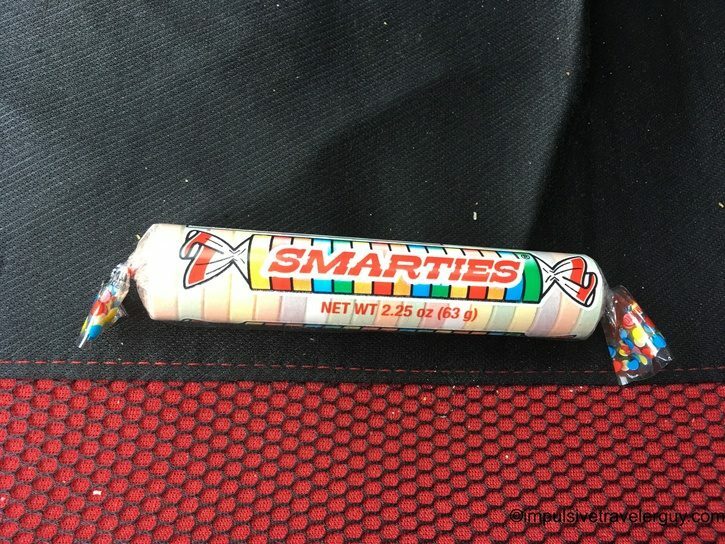 I posted them in order I took them. In many cases, there’s no rhyme or reason the order. It’s just where I was walking. 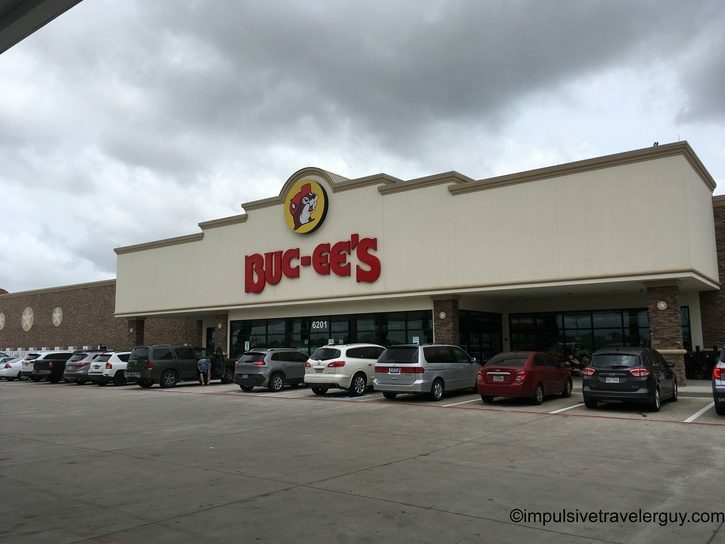 Being that I had a lot of Buc-ee’s to visit, I made my visits short and sweet. Mainly either get gas and/or buy something and use the bathroom if need be. 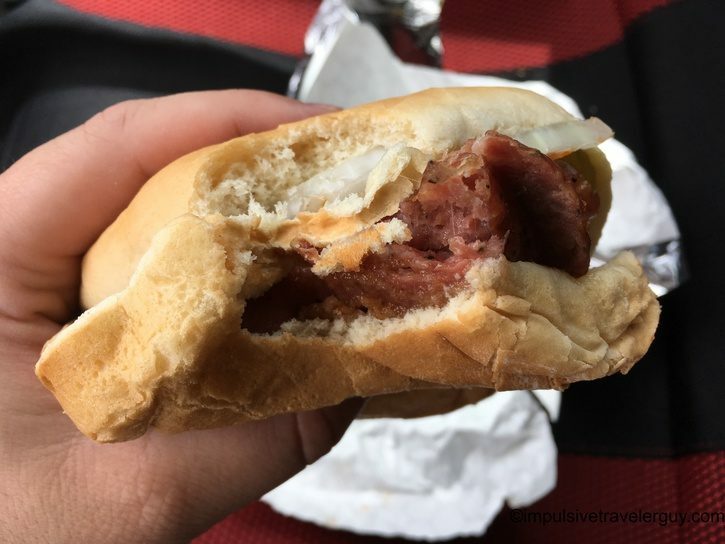 For the Temple location, I got gas and also a breakfast sandwich. 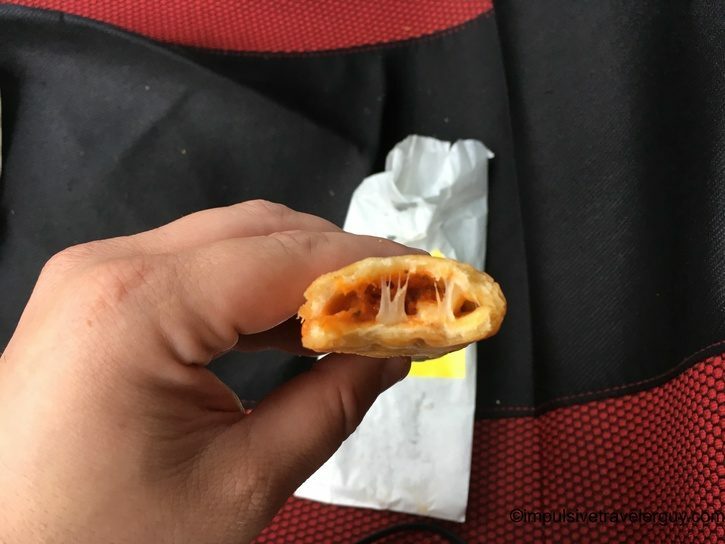 I started eating my breakfast sandwich and hit the road. 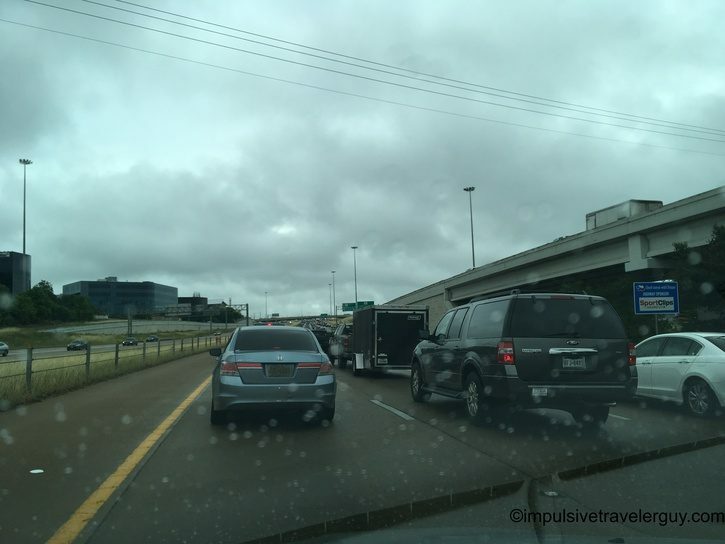 It would be a long drive to Fort Worth. 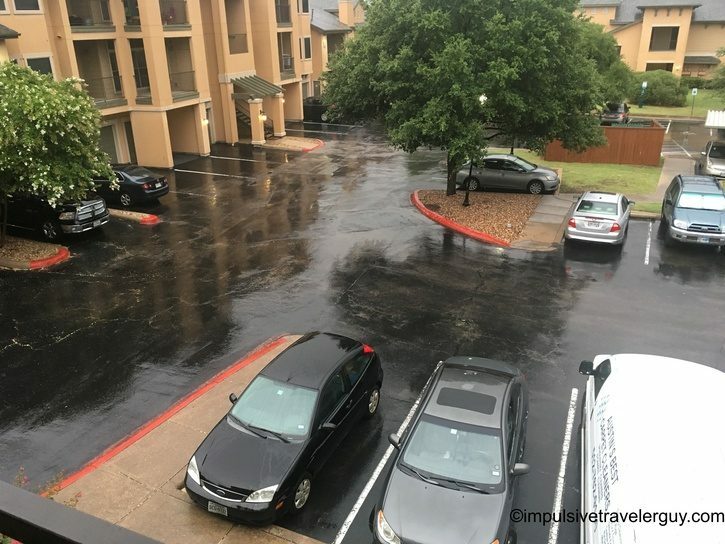 At least things were starting to clear up! 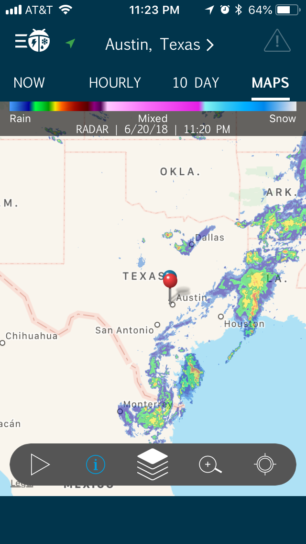 Fort Worth came in sight soon enough. 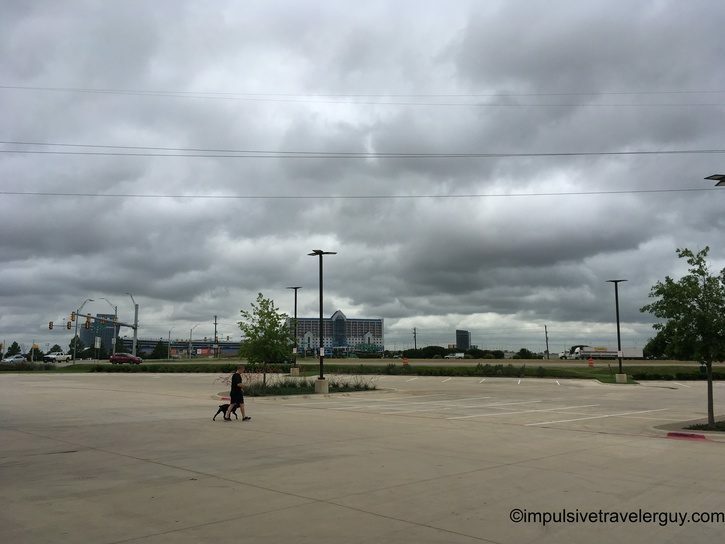 This is across the road from the Texas Motor Speedway. 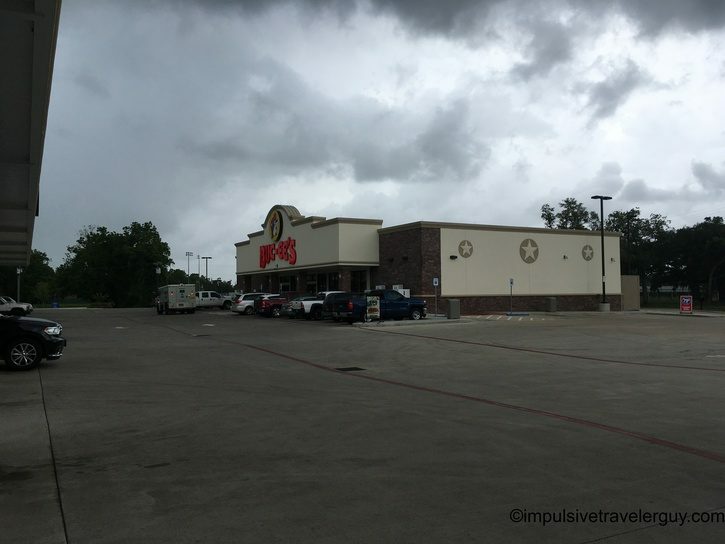 Honestly, I could see this being a perfect location for a Buc-ee’s. I’m sure there’s plenty of race fans that find this place convenient. I know I do when I’m heading back from Wisconsin. It tends to be one of my stops. 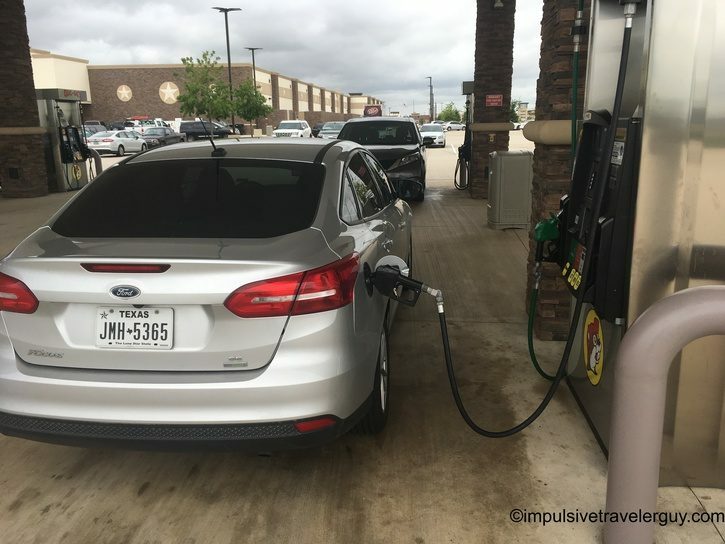 For this trip, I just filled up with gas. With a full tank of gas I headed to Terrell. 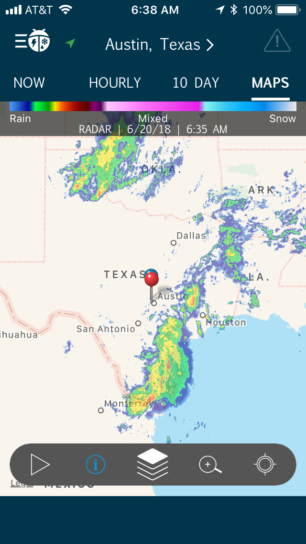 This meant skirting around the DFW metro area. The clouds that were breaking up earlier began reviving. 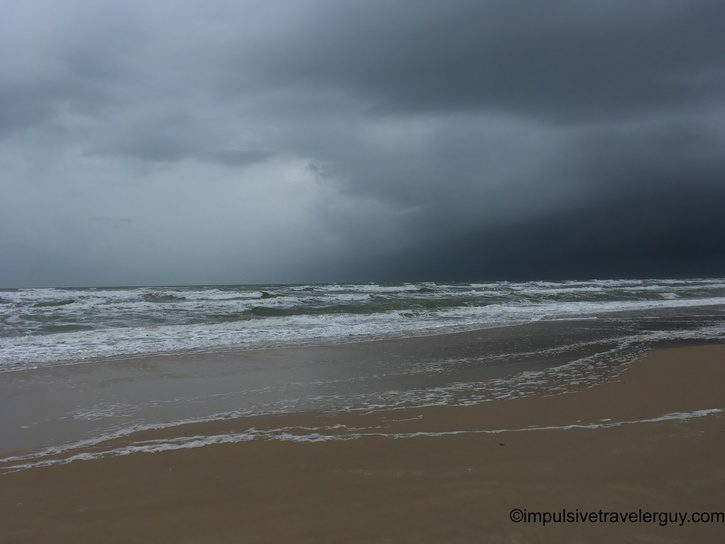 It was soon raining on and off again. 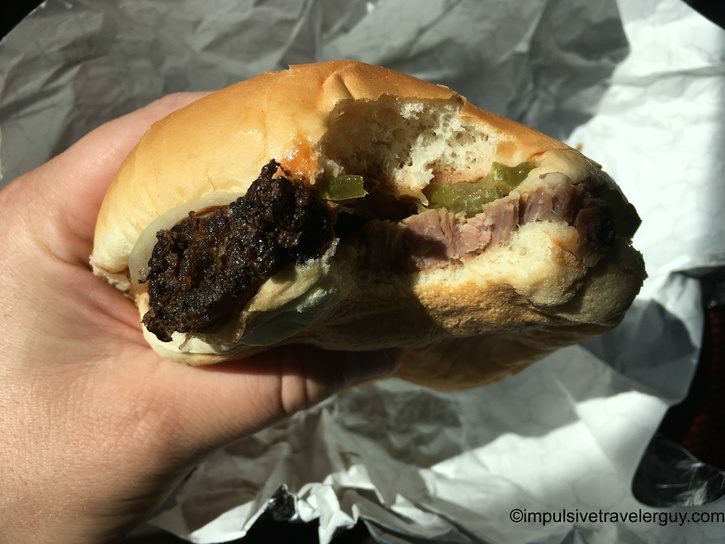 I made it to Terrell and got myself a brisket sandwich for lunch. 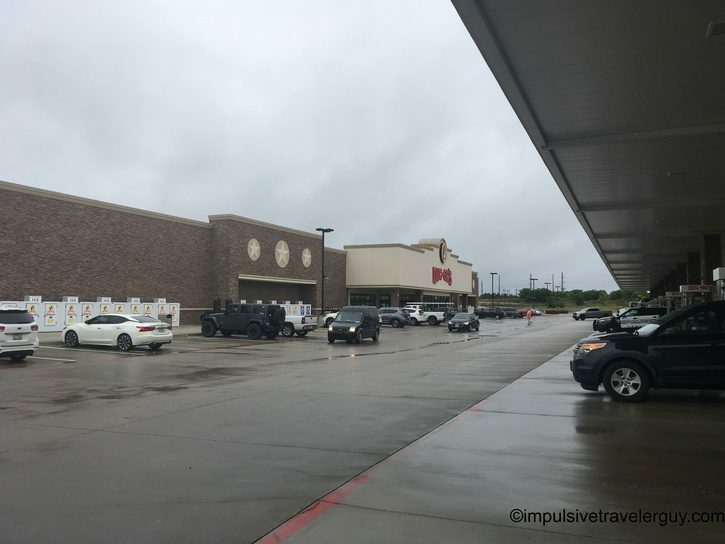 My next planned stop was the Madisonville Buc-ee’s. 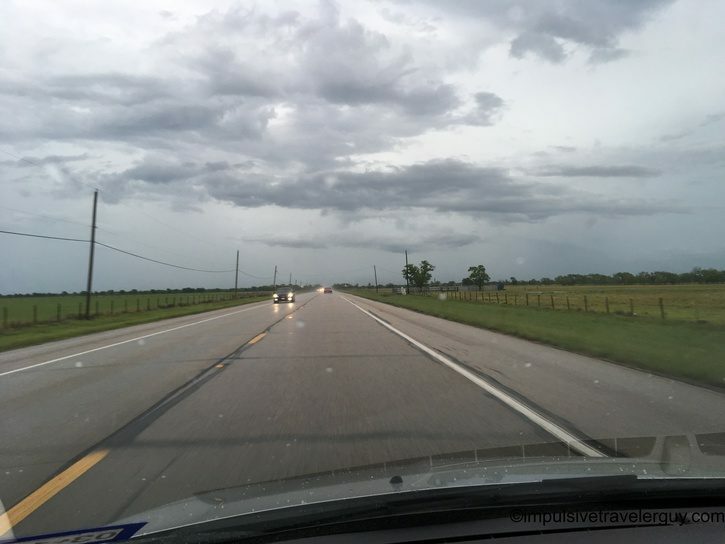 The sky turned from somewhat clear to very ominous. 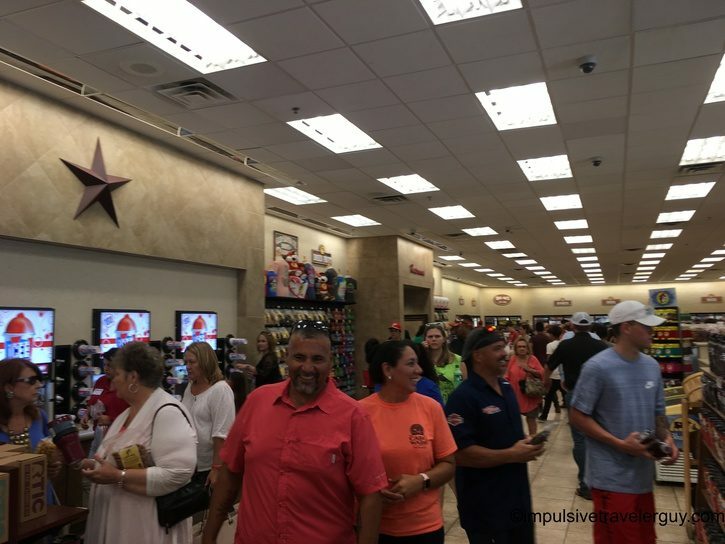 When I arrived at the Madisonville Buc-ee’s, it was very busy. Part of me was thinking it is the main attraction in that area. I fought through the crowds to get a cup of Big Red and also a snack cup. 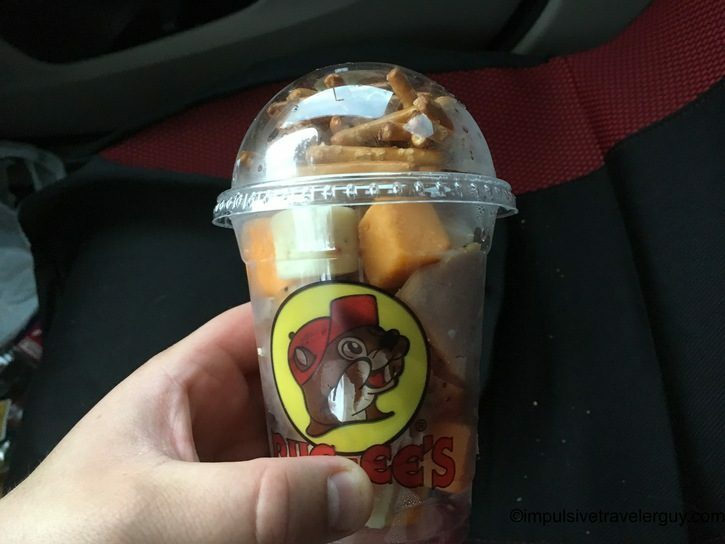 I love Buc-ee’s snack cups because they contain my favorite food groups, meat and cheese. 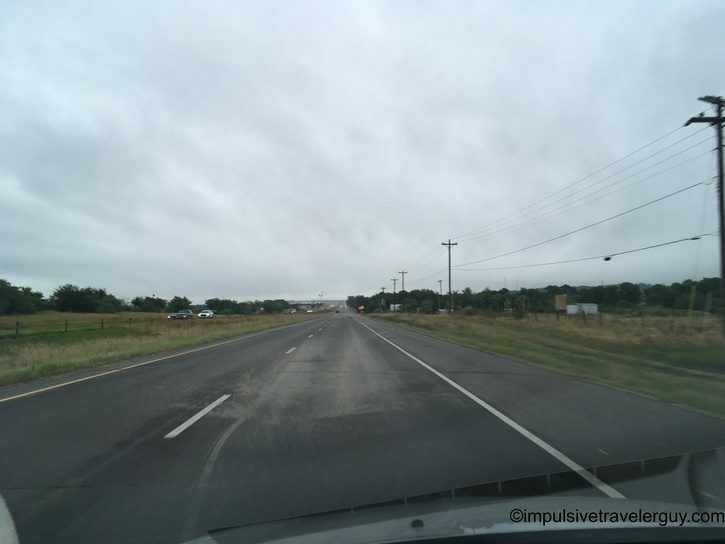 My last destination for the day was the Bastrop Buc-ee’s. 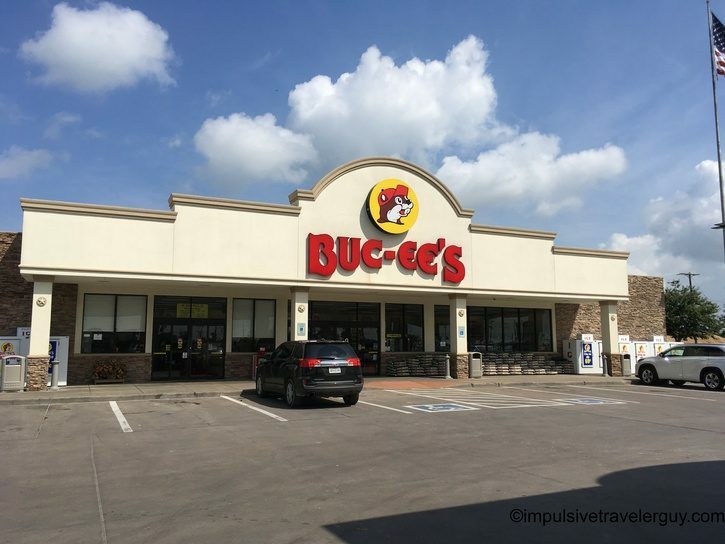 I would come to find out that this Buc-ee’s was the center of the Buc-ee’s universe from Austin. This was the only day I stopped a here, but the other days I would drive past it. For this stop I got gas and pickled quail eggs. 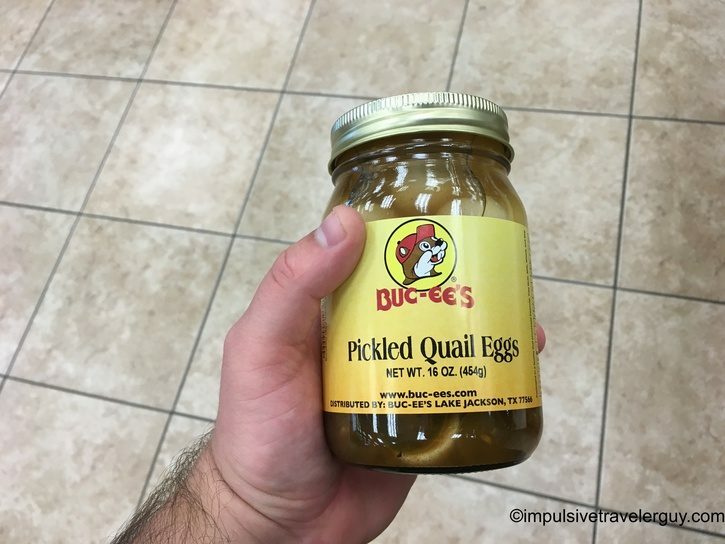 That’s the one thing about Buc-ee’s, they have some very unique items! 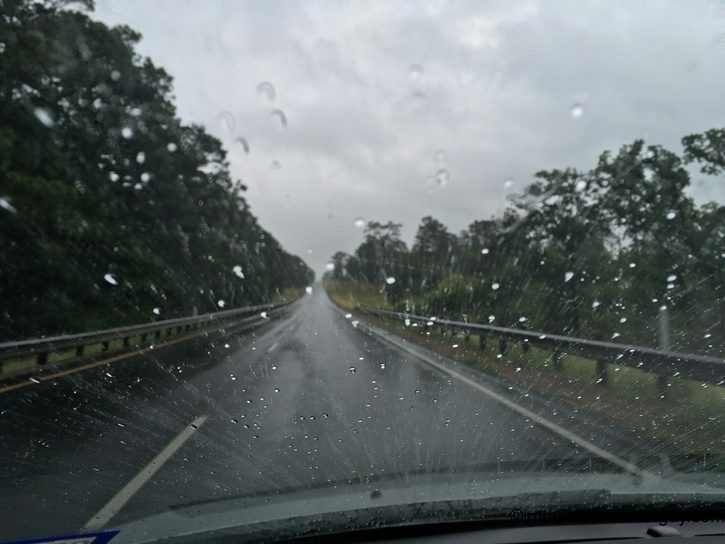 The drive back to Austin was what I expected. A large traffic jam at the start of rush hour. 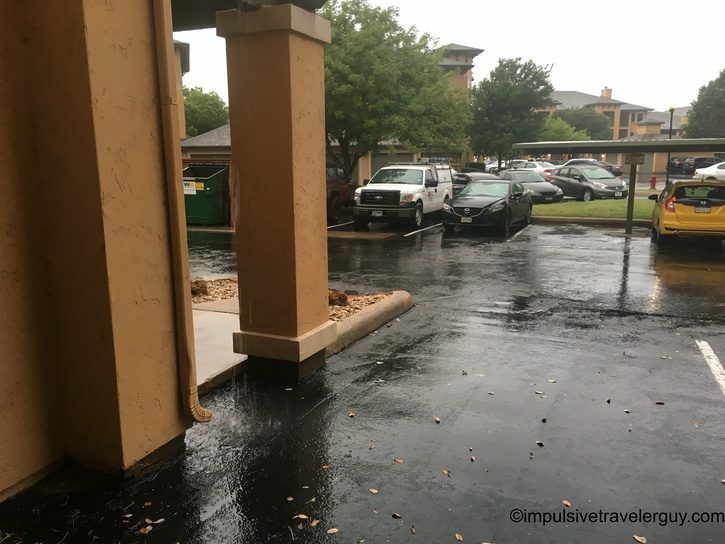 The next morning on June 20th, I decided to check what kind of weather was in store. Outside appeared to be a bit drier from a first glance. 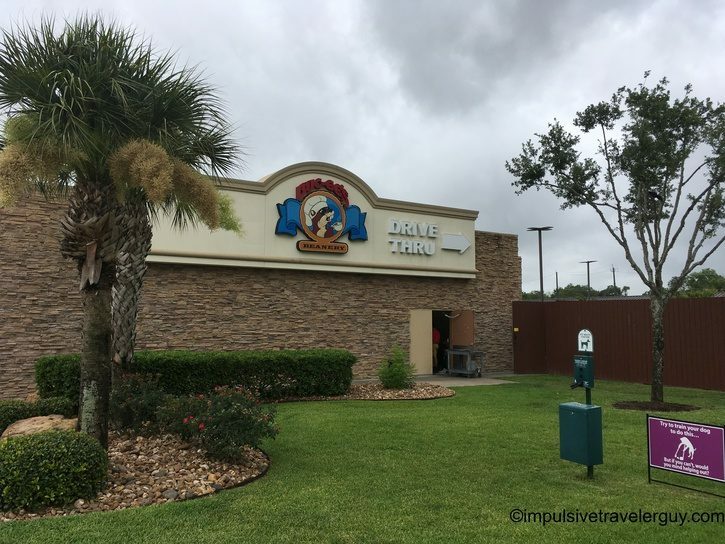 Buc-ee’s was founded in Lake Jackson, TX. 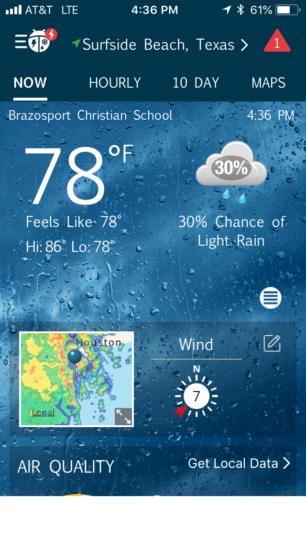 This is in the Houston area so it makes a lot of sense there’s a bunch of them clustered there. The previous day I had hit up 5 of them with a ton of driving in between. Today, I had 21 planned and they were much closer to each other. 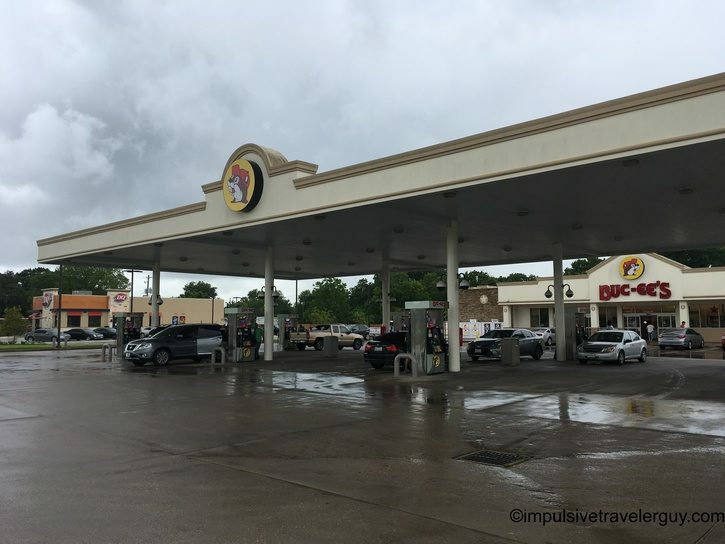 In addition to more Buc-ee’s, I got the see the “Baby Buc-ee’s.” These Buc-ee’s are normal gas stations and some can be very small. 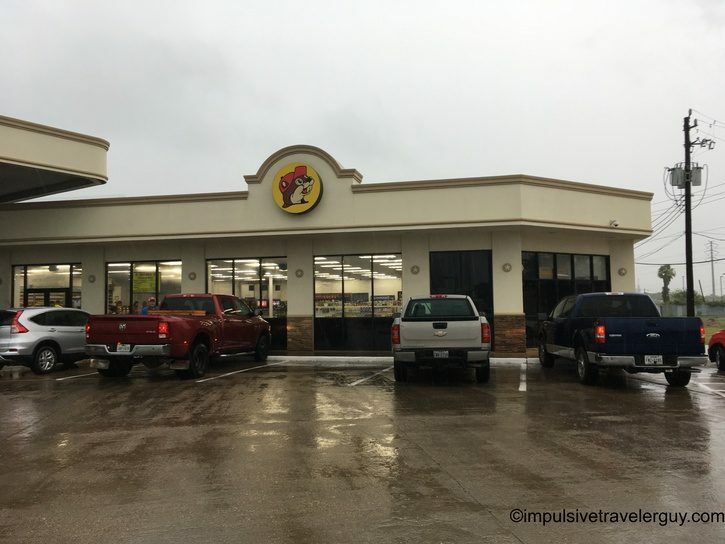 If you have only been to their travel centers (like I only had before), it’s like a shift in the universe to see a Baby Buc-ee’s. Another shift was in the awkwardness of taking pictures. 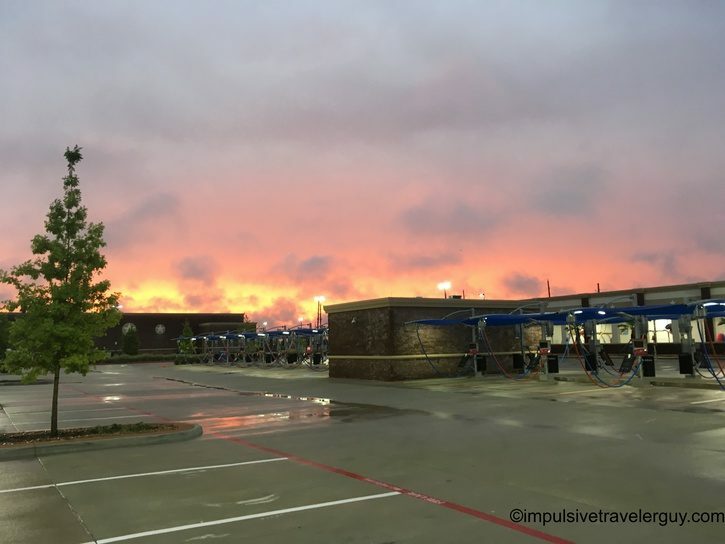 When I was at a travel center, everyone was taking pictures. 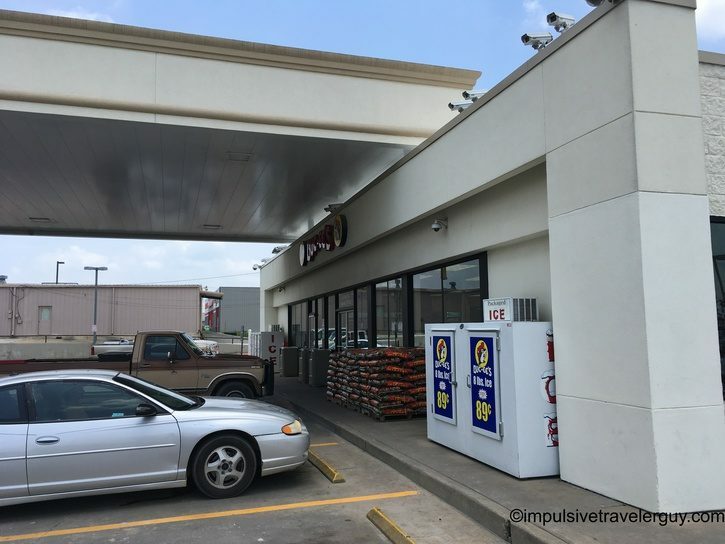 Normally, people won’t take pictures of a regular gas station. I caught the attention of a couple different managers. All these managers ended up being very helpful and first asked me if I needed help finding something. 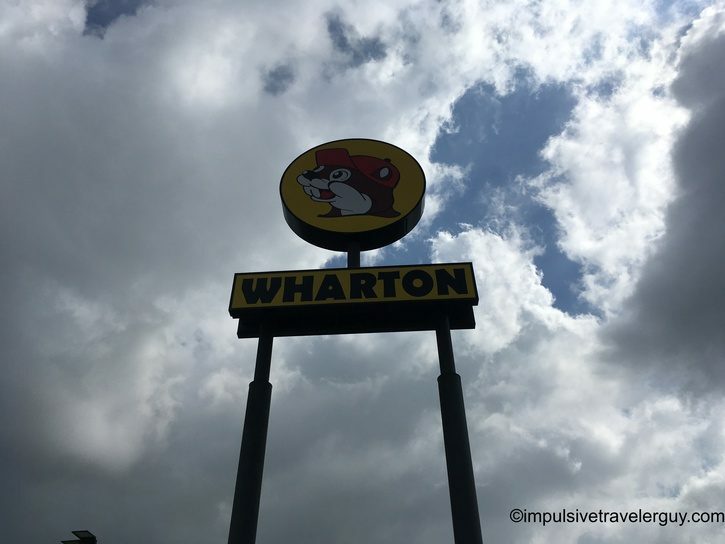 When I told them about my Buc-ee Mania quest, they seemed very receptive. I had some cool conversations with them and it’s clear that Buc-ee’s hires some good people. 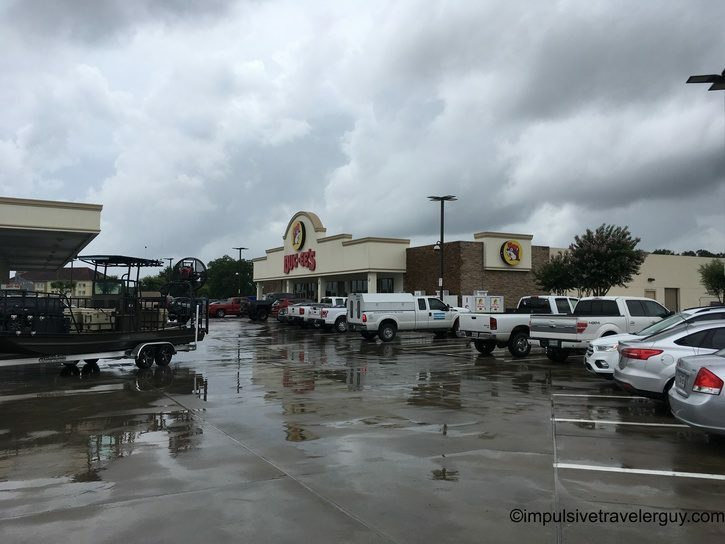 At the end of this blog entry, I’ll get more into what I think about Buc-ee’s employees and their hiring process. 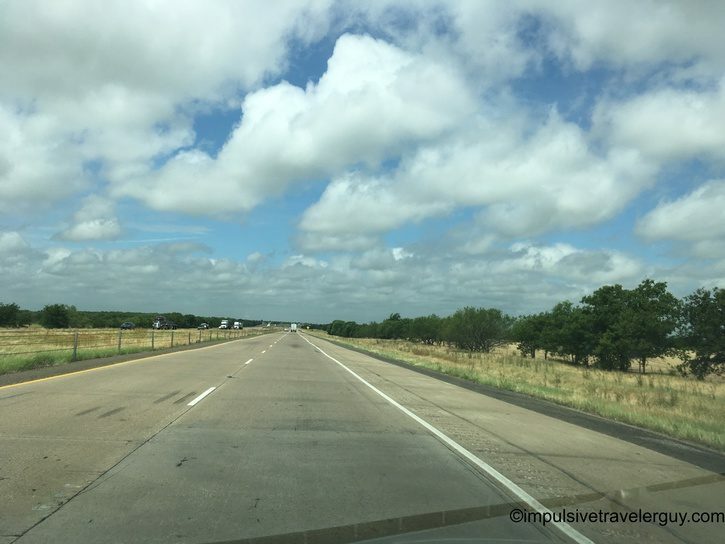 My first stop was Giddings. 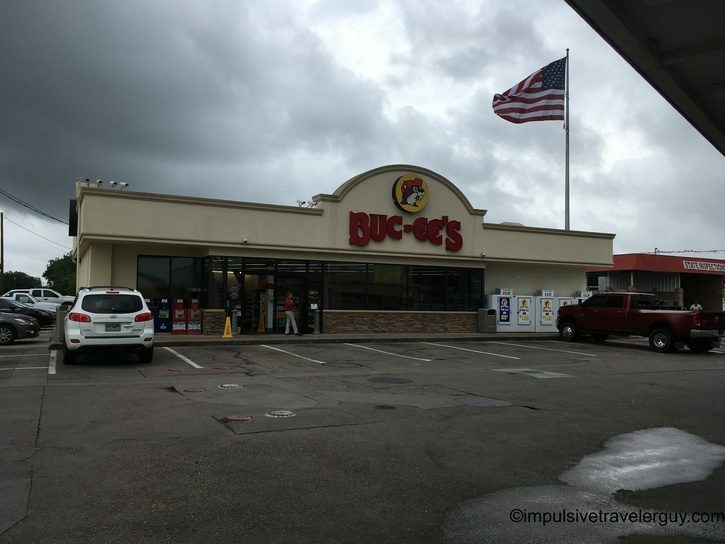 This is a smaller Buc-ee’s and it actually set the tone for a bunch of smaller ones I’d be visiting later in the day. Now I thought there’d be a kink in my travel plans. 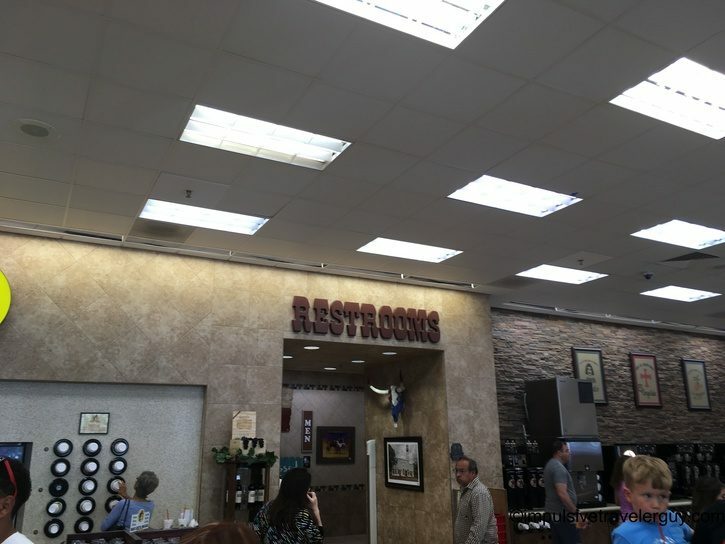 Buc-ee’s prides themselves in their clean bathrooms. I actually really had to go so my heart sank as I saw a “closed for maintenance” sign. Everything was all good. Upon them seeing that I needed to go, they let me go. The maintenance was cleaning. 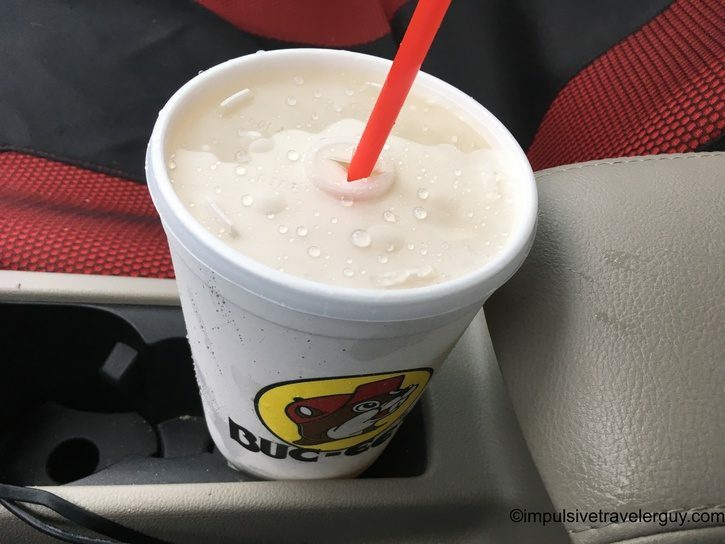 It’s something that’s constantly being done at Buc-ee’s. 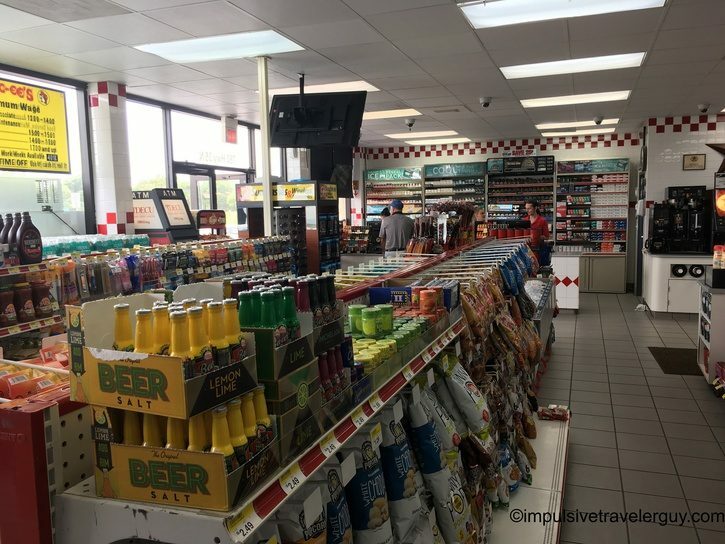 In the travel centers there is a small army of people doing it. At the smaller ones, there’s a single person. They obviously had to put this sign up since it was a female worker in the male bathroom. They happily accommodated my need to go to the bathroom. This is great because I’ve had gas stations basically say I’m out of luck as they cleaned. 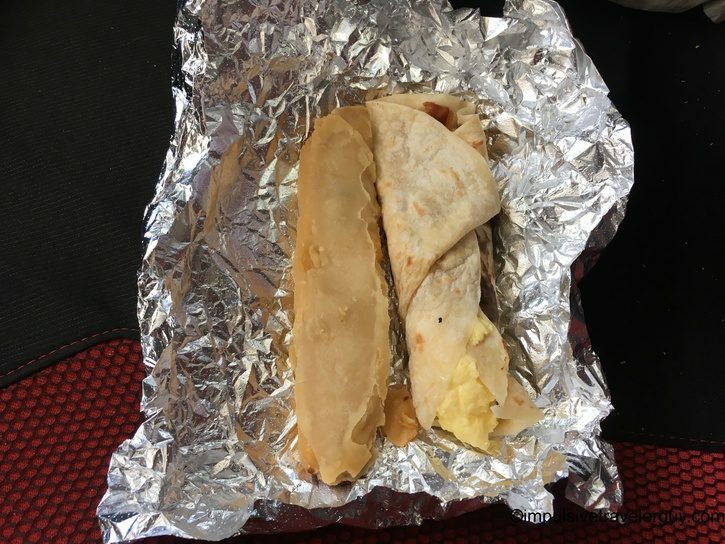 After doing my duty, I went and got a breakfast taco and some Southwest trail mix. Now this is where things started to become a blur. 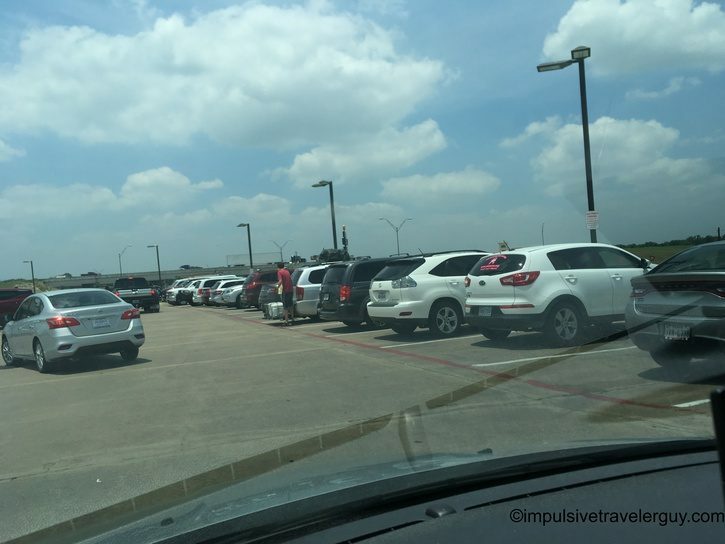 While I love Buc-ee’s and the products they offer, visiting so many in a day becomes very repetitious. 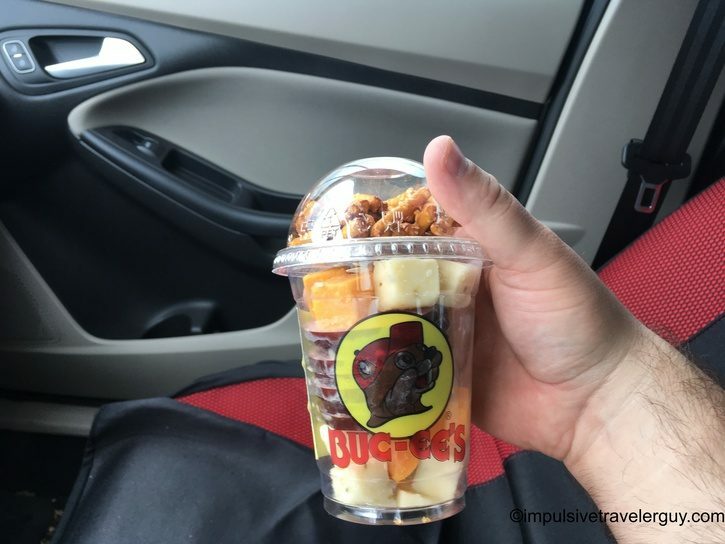 Buc-ee’s does have a great consistency in its brand (which I’ll get more into later). With this consistency, things start to blend in. I started to get into an autopilot mode. 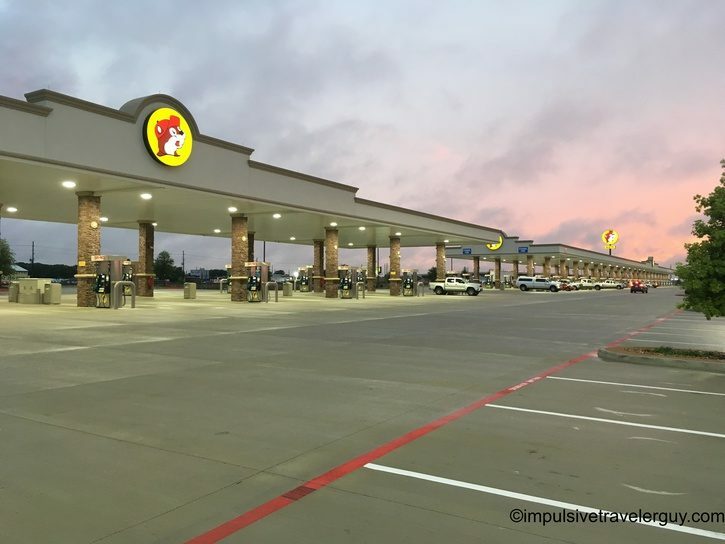 I’d drive to the next Buc-ee’s. 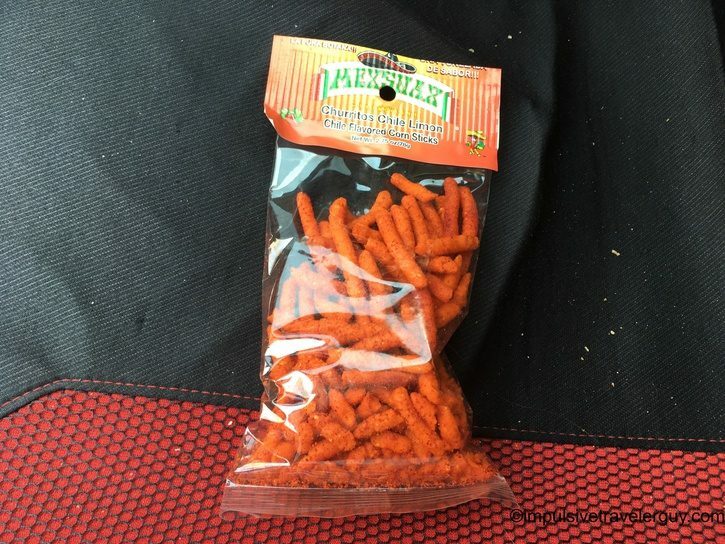 Pull up to the gas pump if I needed gas. If I didn’t need gas, I’d find a parking spot. I’d go inside and use the bathroom if need be or just snap a few pictures and then buy something. Then the whole routine would start over again. I really got to see the brand in action! After Giddings was Waller. I got a Mountain Dew to get some more caffeine flowing through my veins. While drinking Mountain Dew, I headed to Cypress. 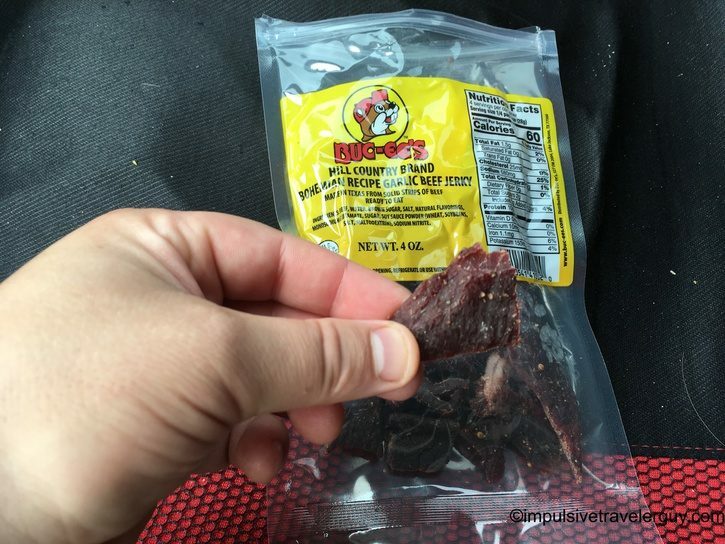 I got some of the Hill Country Brand Bohemian Recipe Garlic Beef Jerky. 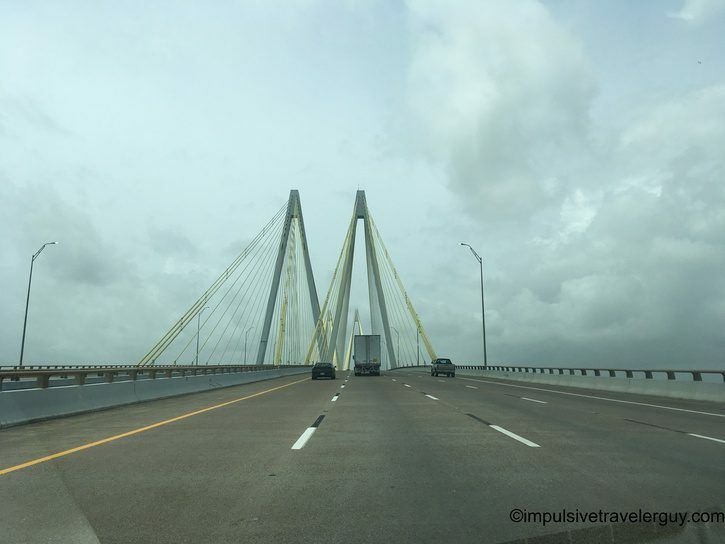 Chewing on some jerky, I hit Baytown. 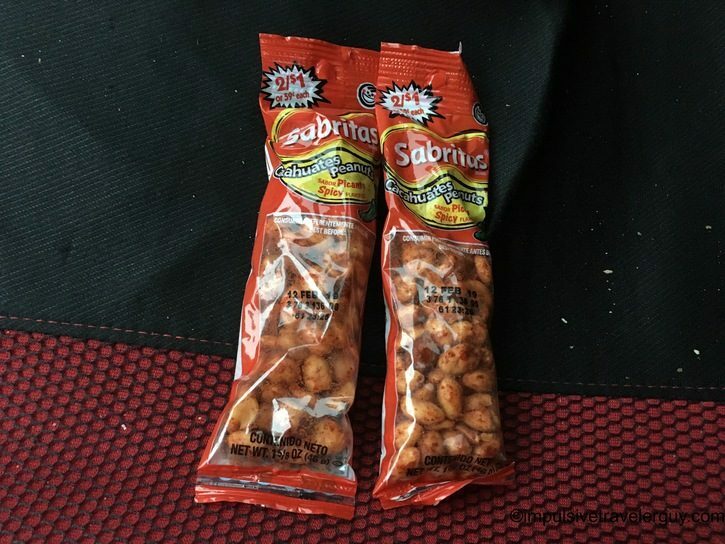 This time I got more than a mere snack. I got a sliced sausage sandwich. 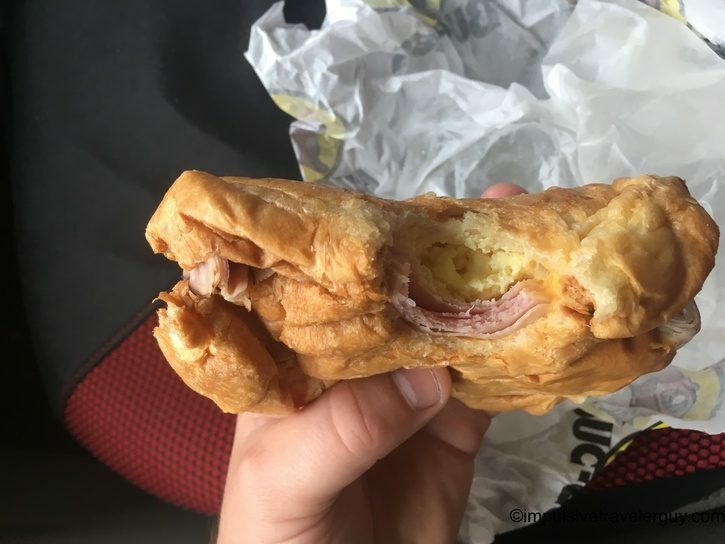 That sandwich hit the spot. 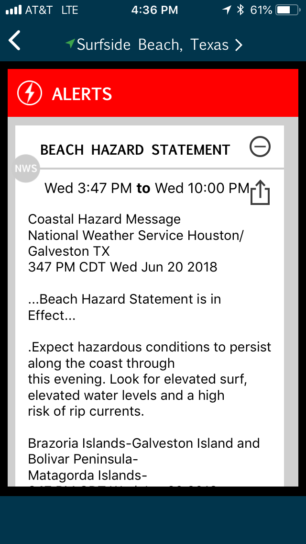 I was soon at League City. 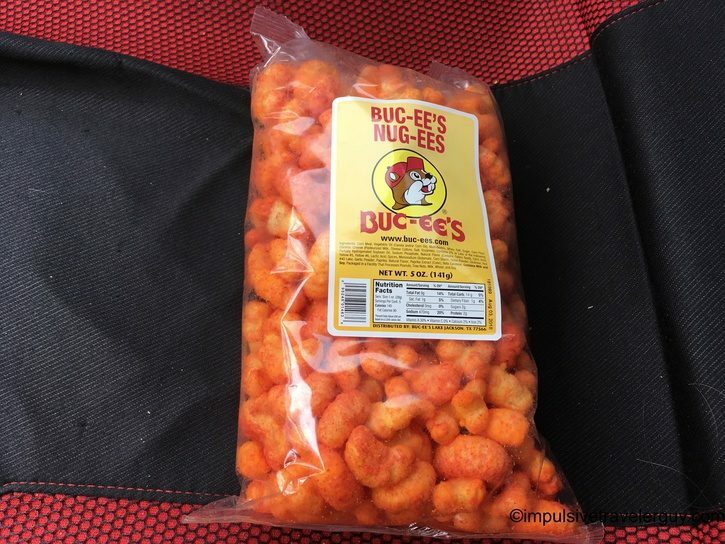 I got some spicy Buc-ee’s Nug-ees for later. 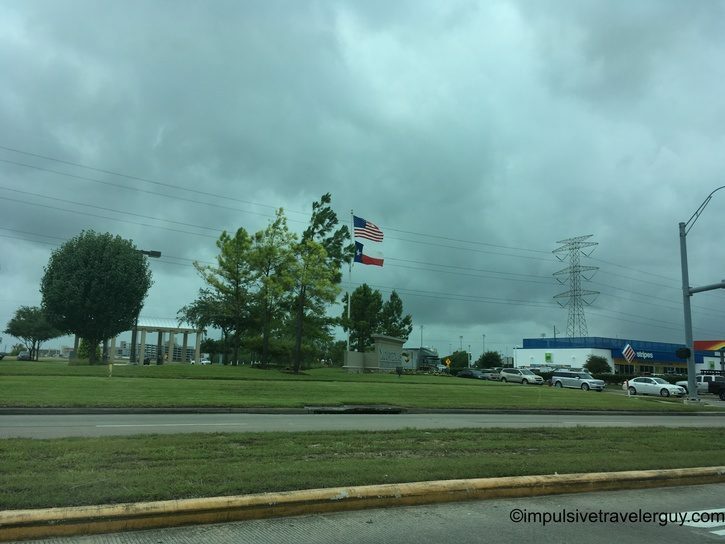 Continuing to drive, I hit Texas City. 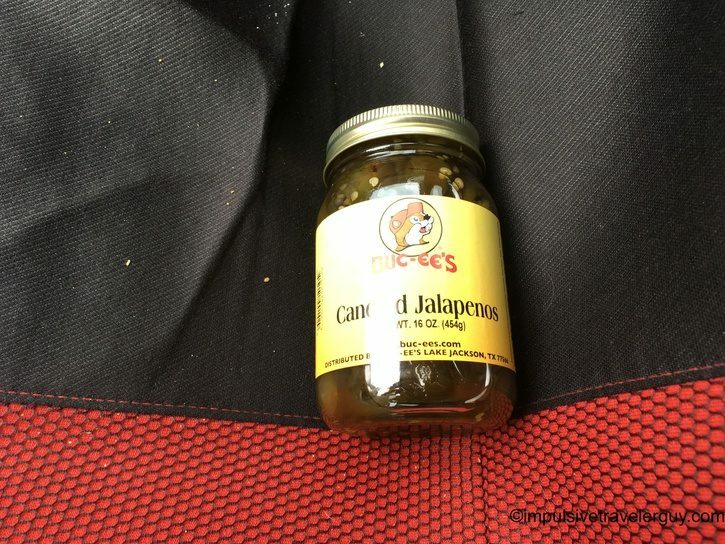 I got my jar of Candied Jalepenos there. 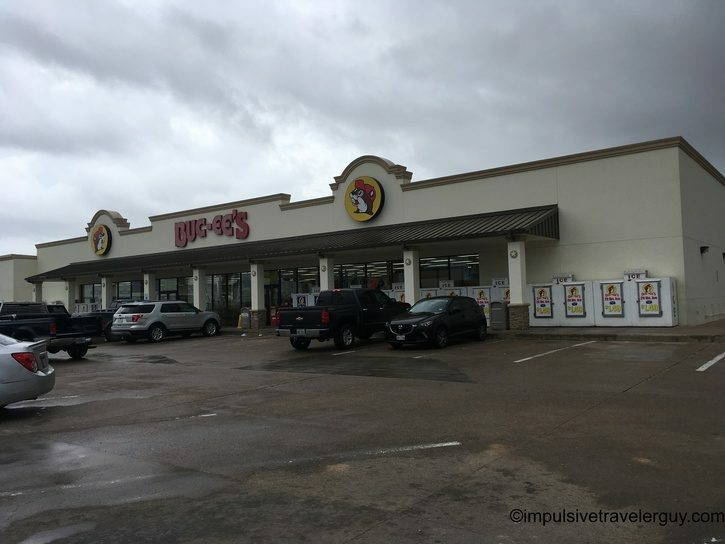 Alvin was the start of the “Baby Buc-ee’s.” These were very small Buc-ees that were the size of a normal gas station. 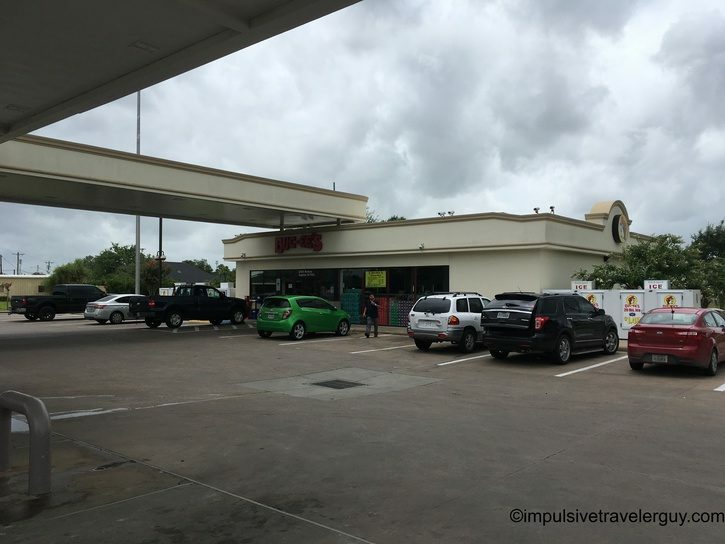 Some of them were so small they had the standard gas station fare and not the Buc-ee’s branded products. 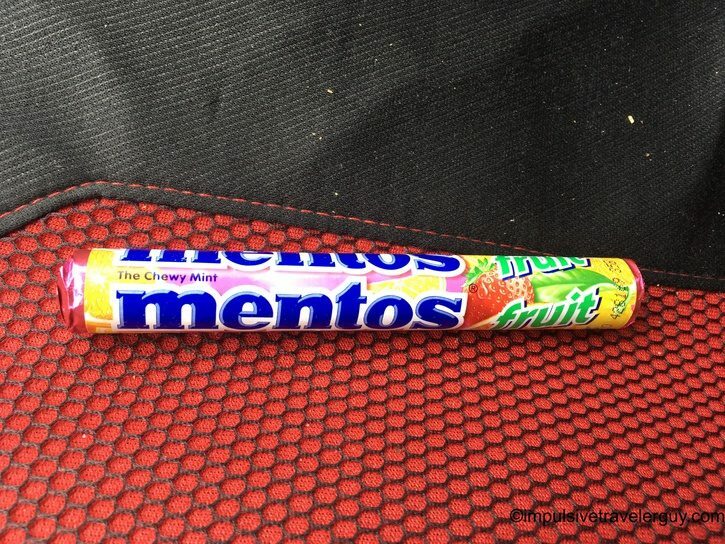 I got Mentos at this one. Now here’s where things got tricky. 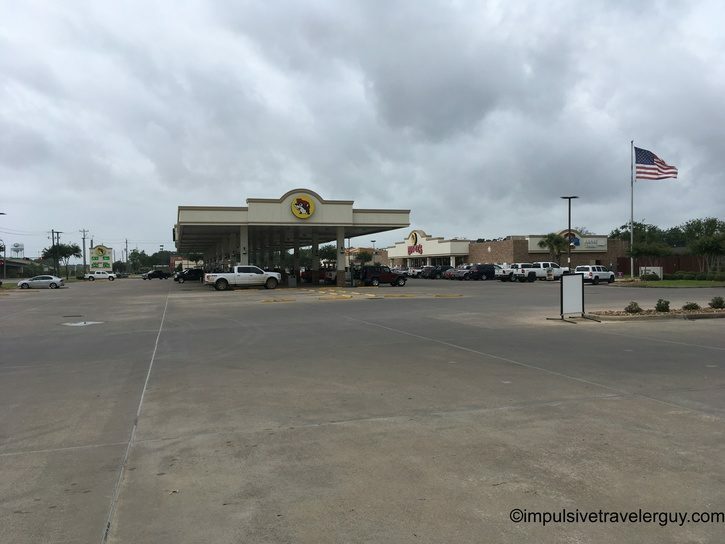 There were multiple Buc-ee’s in a single town. 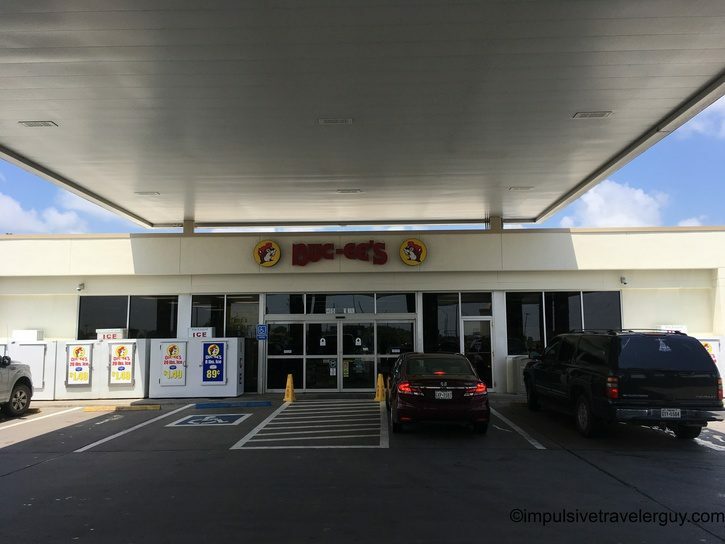 They were essentially the “Baby Buc-ee’s.” They are spaced no different than other gas station chains. It was pretty much a short drive up the road between them. Angelton was the first city I encountered this. 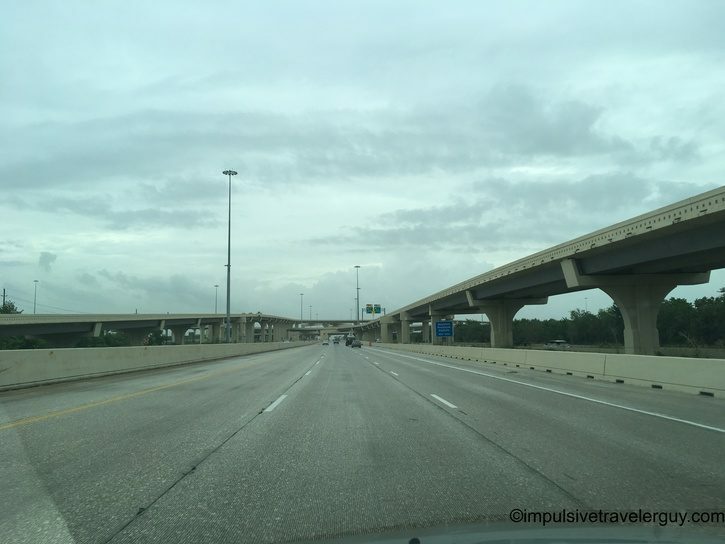 The first one I went to was on E. Mulberry St.
Then came the one on Loop 274. I was then back to Mulberry St. but on W. Mulberry St. 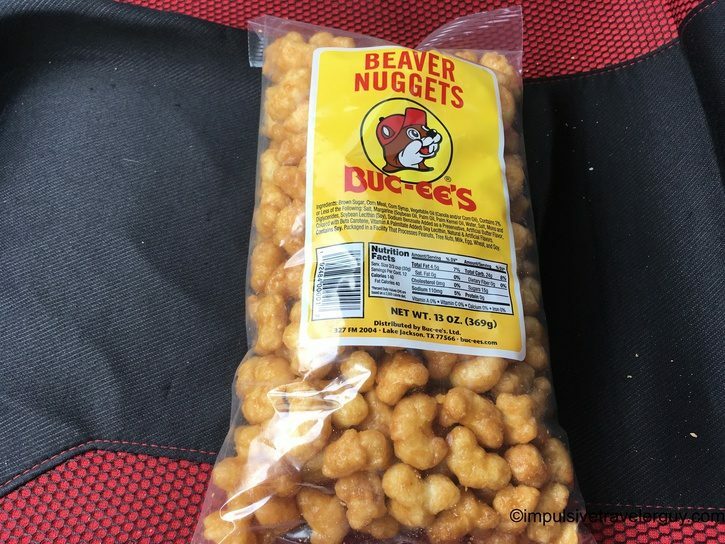 This Buc-ee’s had the legendary Beaver Nuggets so I picked up a bag. 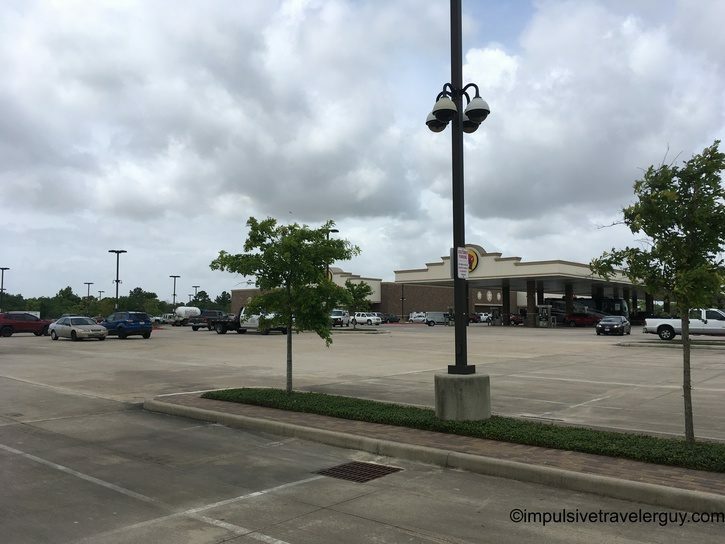 I was soon in Brazoria at the N. Brooks location. This is where things started to go wonky with my credit card. 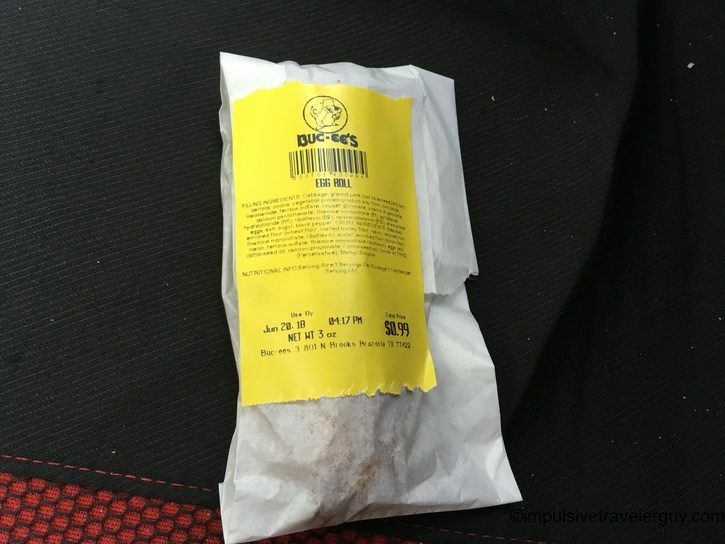 I got a cheap egg roll and paid with cash. As I ate the egg roll, I went to call my credit card company. As I was waiting on hold, another call came in. It was my bank. 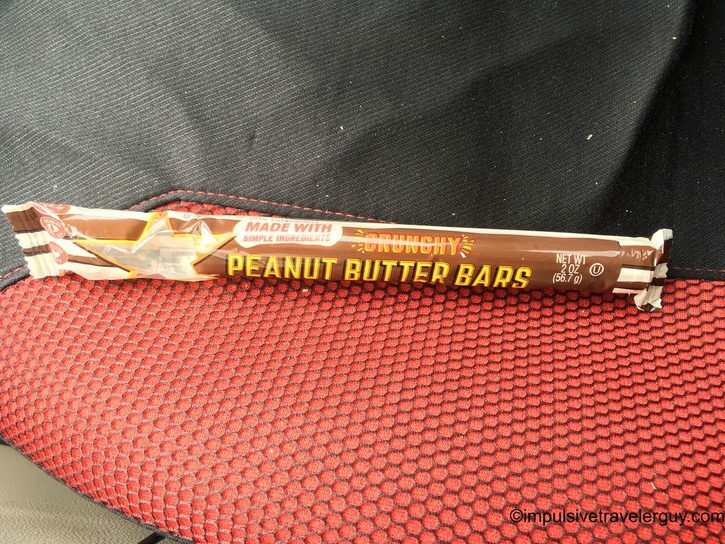 I guess I was being sketchy as heck only using it at Buc-ee’s. Long story short, I told them what I was doing and they said they’d note it in my file. 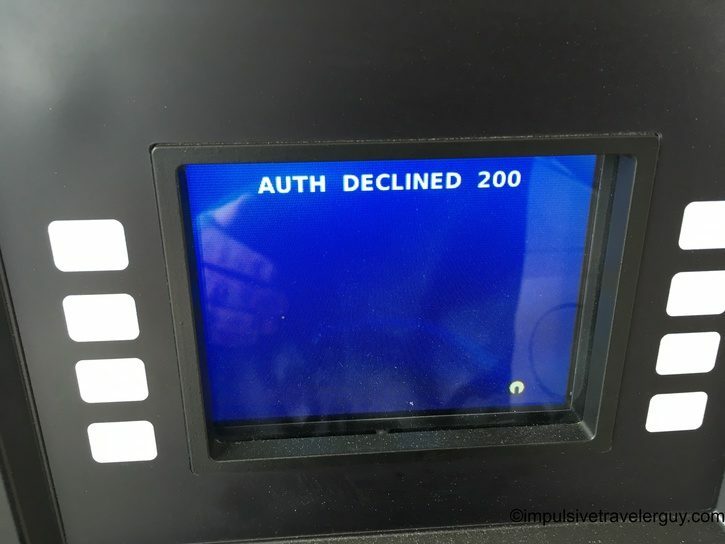 It took until the next day for things to get working correctly so I started paying cash for things the rest of the day. After talking on the phone a bit with my bank, I headed down the street to the S. Brooks location in Brazoria. This is where I got some gas. 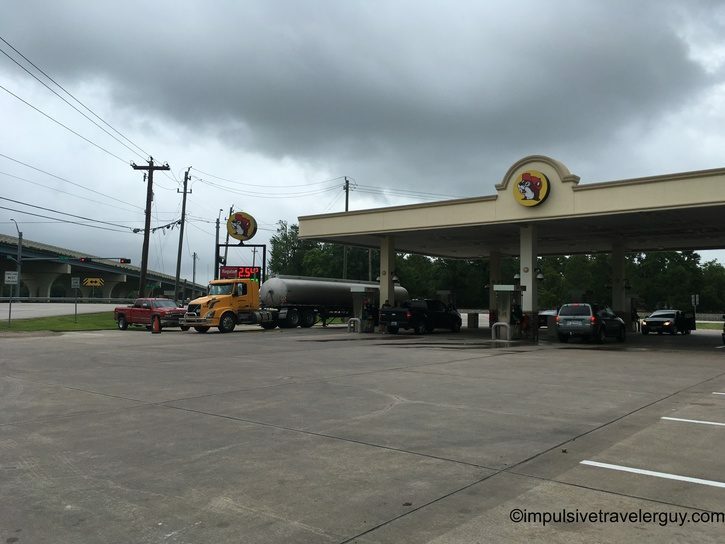 My next stop would be in Buc-ee’s home city of Lake Jackson. Lake Jackson has several locations and my first stop there was the one on Hwy 2004. 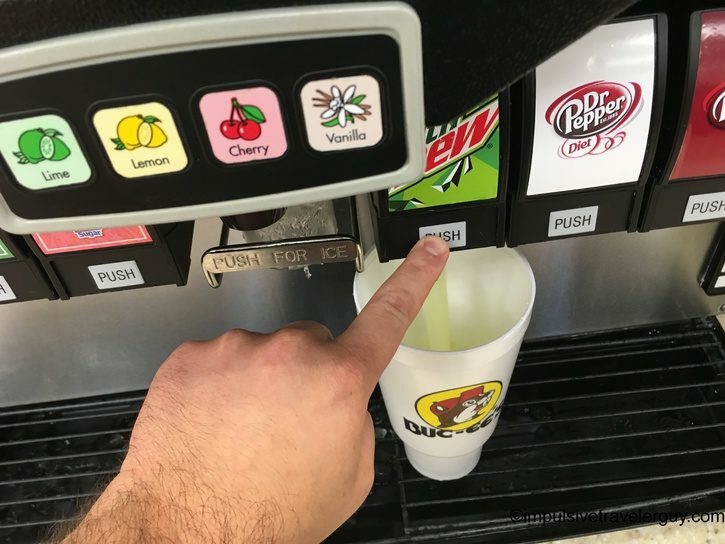 I got some of Buc-ee’s lemonade. 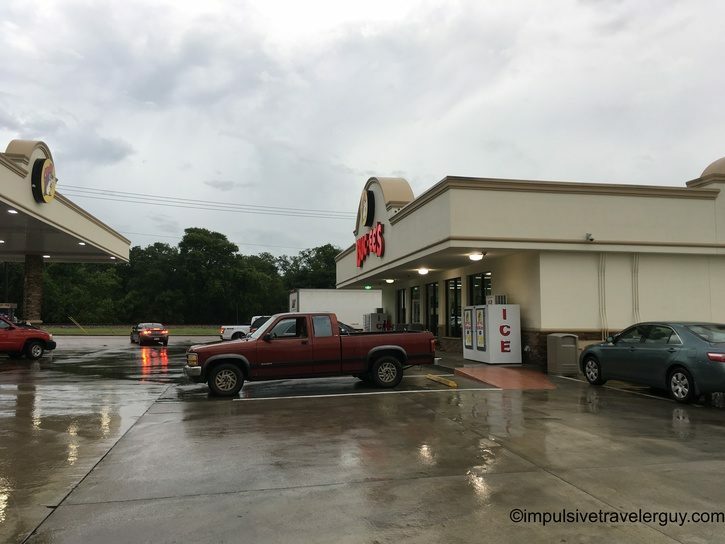 The second Lake Jackson location on Hwy 332 that I visited had a small coffee shop with it and a car wash. They also had an ATM, where I was able to get more cash. 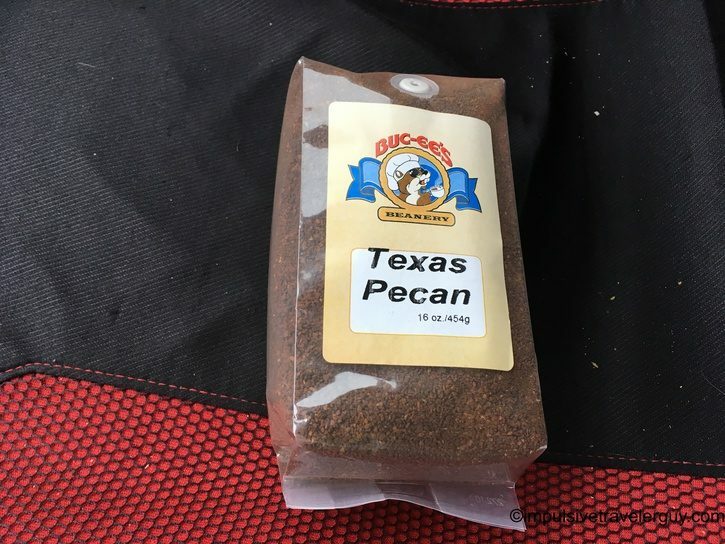 I got some cash and also a bag of Texas Pecan Coffee. 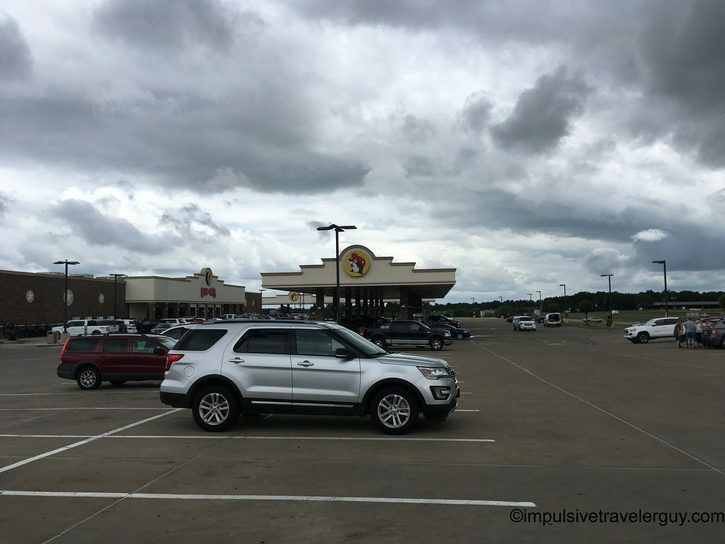 There was another Lake Jackson Buc-ee’s on my list, but I first went over to Freeport. I was trusting the route optimizer. 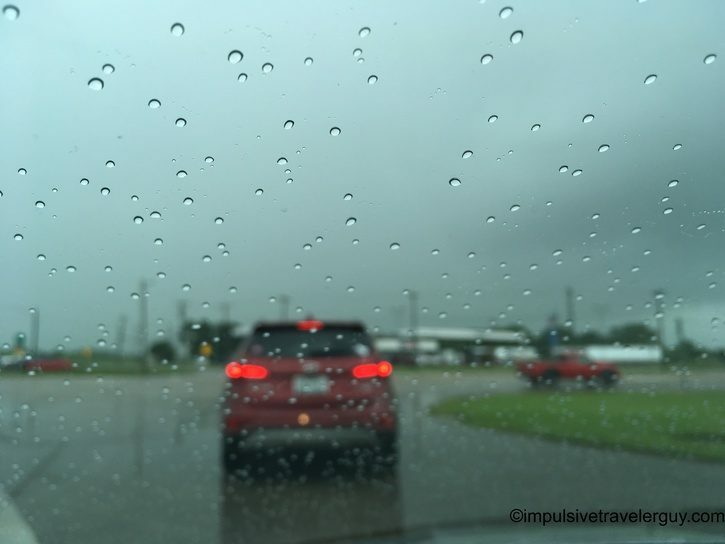 This Freeport location was on E. Hwy 332. 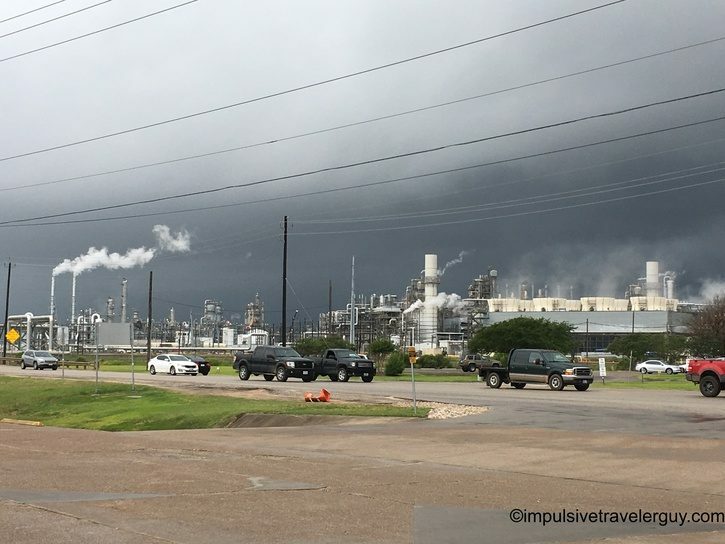 Now things were starting to look pretty nasty out and traffic was horrible by a refinery. 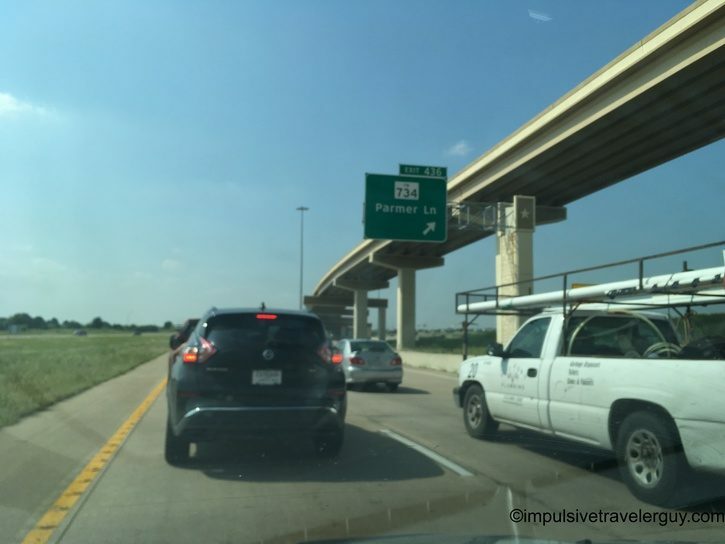 I took a right turn out of the Buc-ee’s because a left turn looked impossible with the traffic. I think the shift must have just ended. Somehow I ended up at the Gulf of Mexico at Surfside Beach. Bad weather or not, I was on a mission. After a short visit to the beach where there was a surprising amount of people, I headed to the next location. 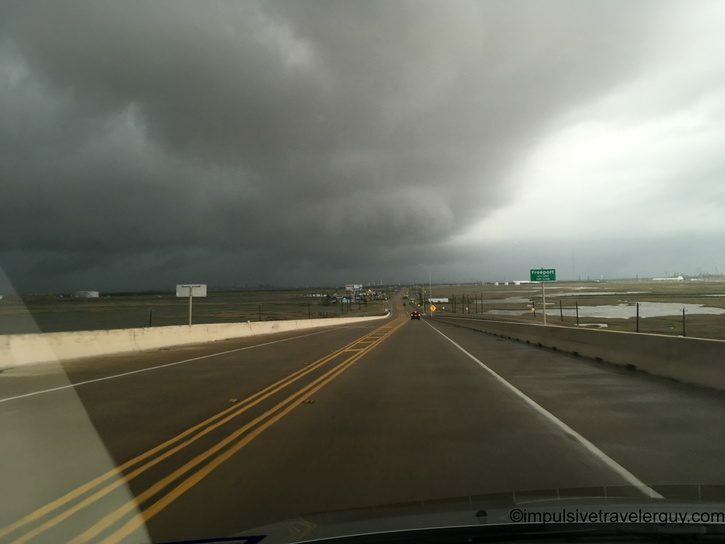 This was on Brazosport Blvd. 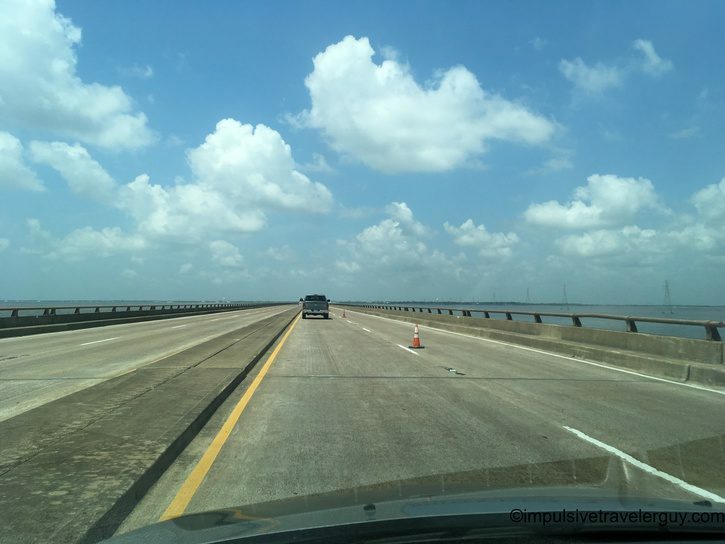 From Freeport, I was back in Lake Jackson. 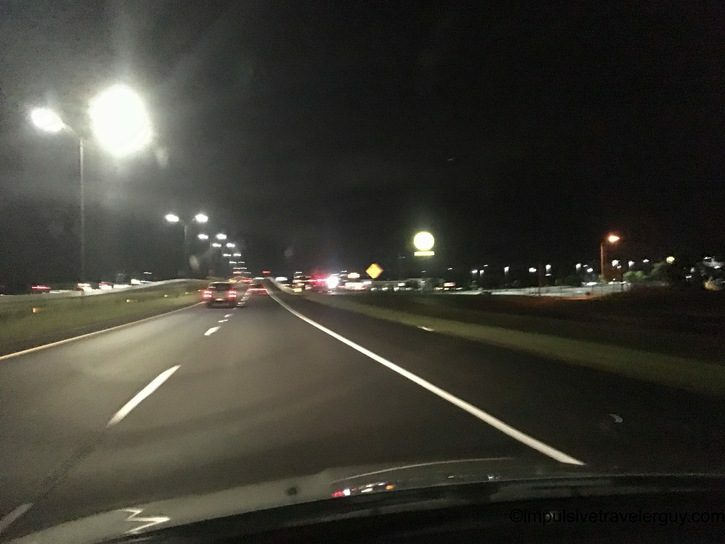 I hit up the Oyster Creek Dr. location. Before I knew it, I was in Pearland on S. Main St. This felt like the babiest of Baby Buc-ee’s. 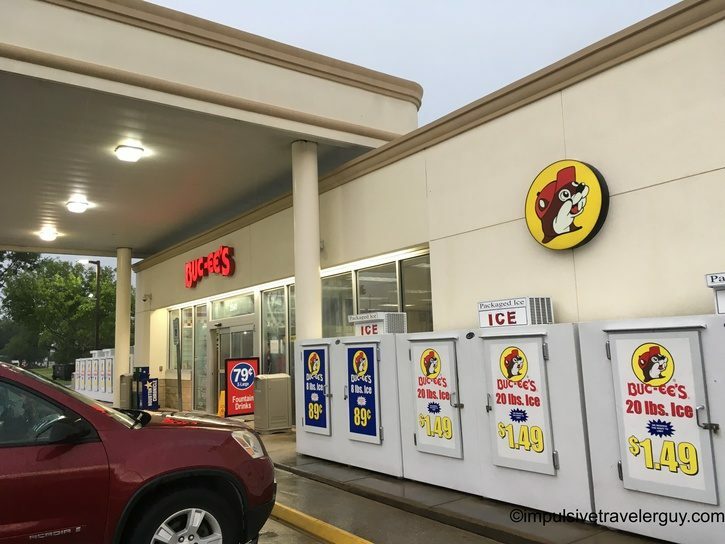 Pearland has a slightly bigger Buc-ee’s. 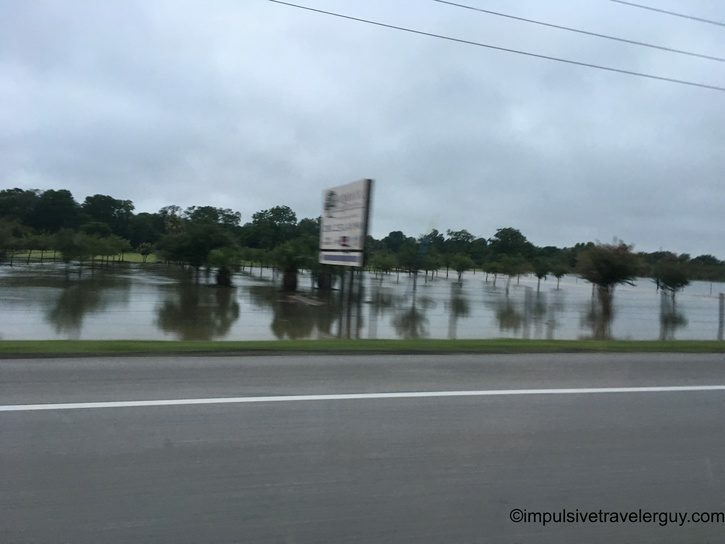 This is on Shadow Creek Parkway. The second to last visit for the day was in Richmond. 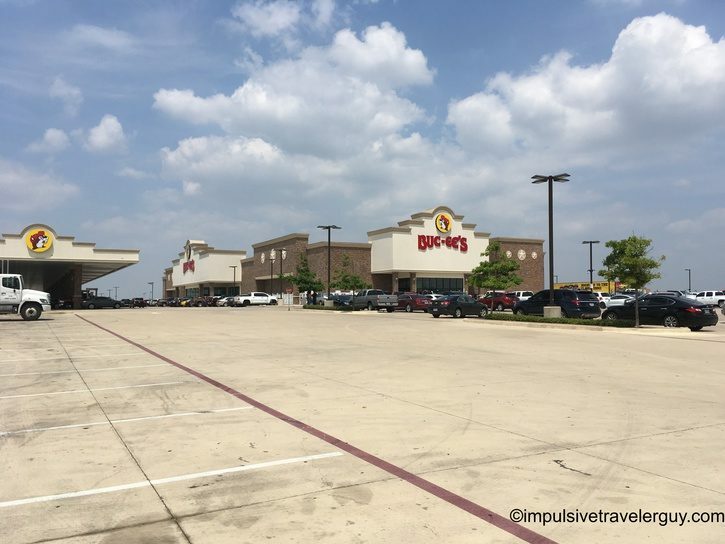 The Buc-ee’s were starting to get bigger again! My last stop for the day was the Katy location. This location is a far cry from the Baby Buc-ee’s. 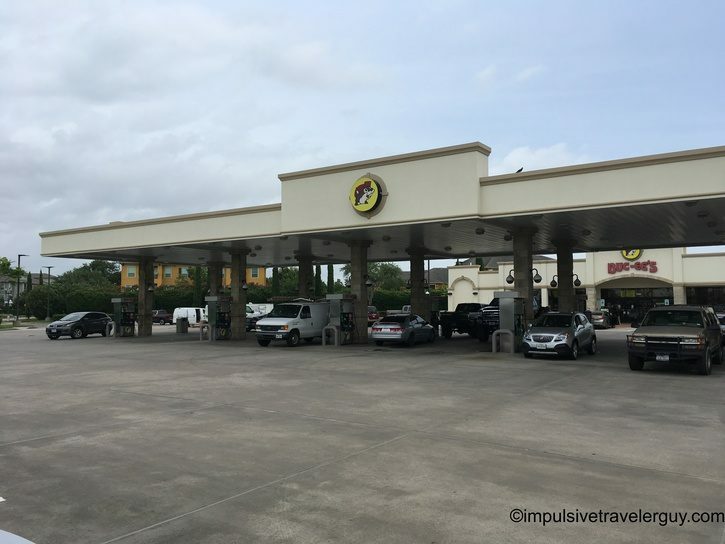 It is one of the larger travel centers and also has the longest carwash in the world! 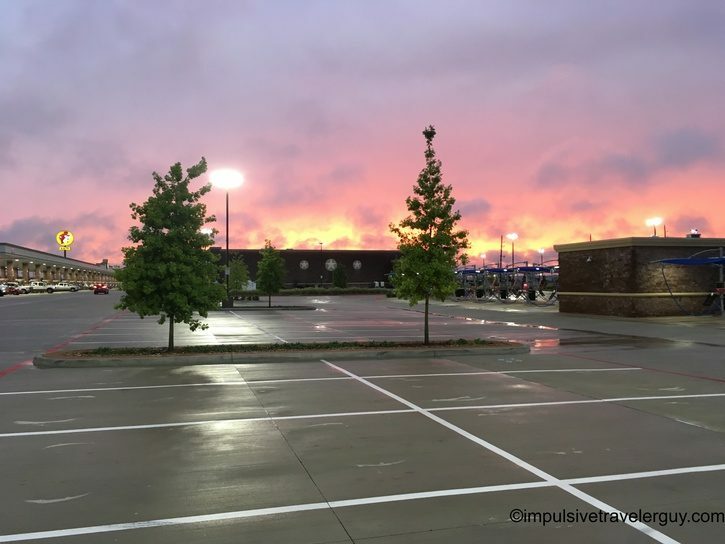 I had fought storms all day long, but the clouds left me a beautiful sunset. It made for some good pictures! 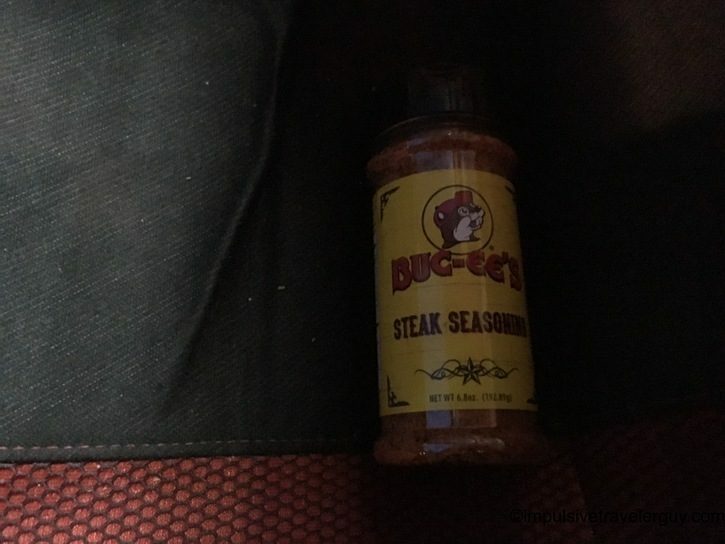 I ended up getting some steak seasoning. The day ended up being long with me starting around 7am and not getting home until after 11pm. 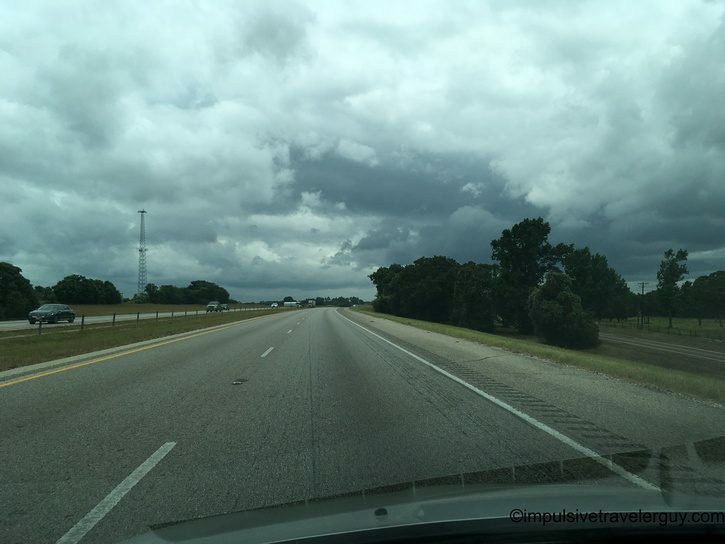 I was definitely tired after all this driving and a bit in a daze from hitting up so many Buc-ee’s in a day. The driving for the day took me in a lot of interesting places. 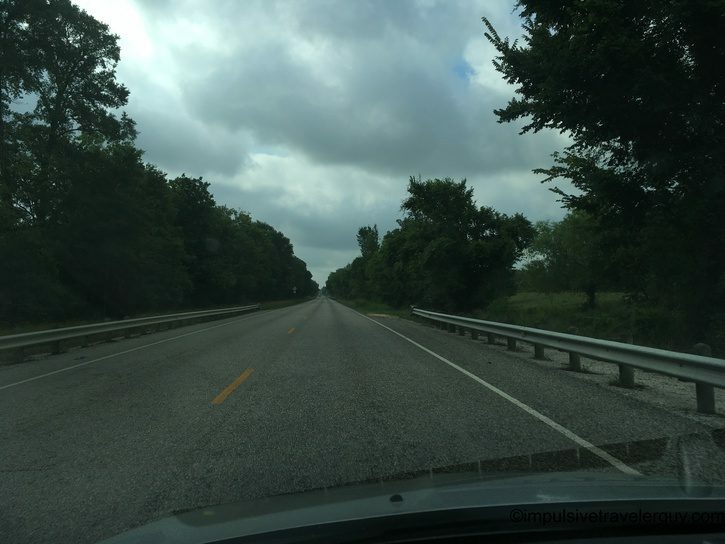 Some of the roads I took were the back scenic roads and I got to see a lot of cool things along the way. 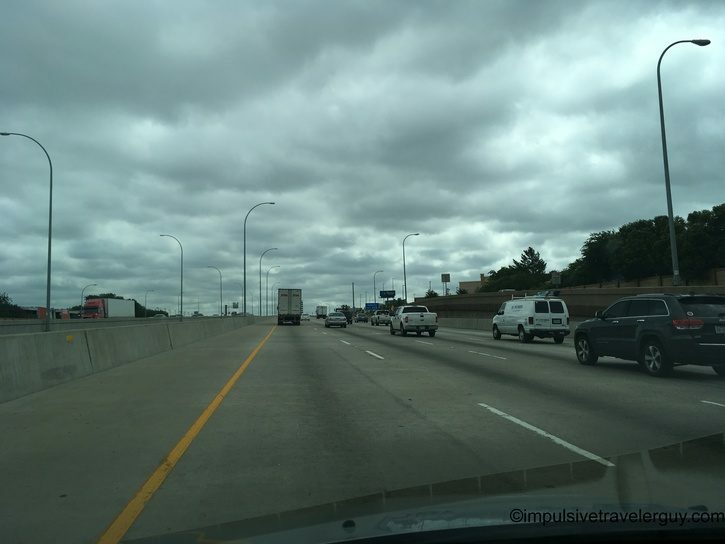 The weather was on and off nasty, but I was able to drive fine. I guess it beats driving in Canadian blizzards. 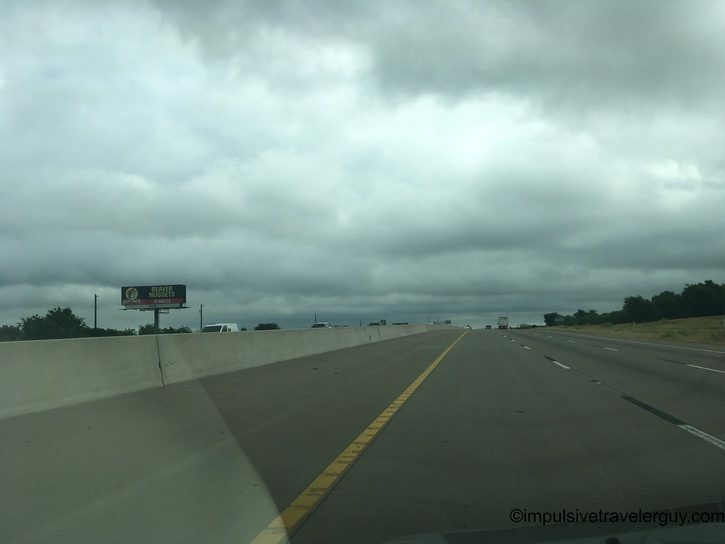 On Thursday 6/21, I decided to delay my trip. My fiancee Victoria and I made last minute arrangements to do some cake testing for our wedding. It was also nice to sleep in after a long day on the road. I proceeded to hit the road Friday. 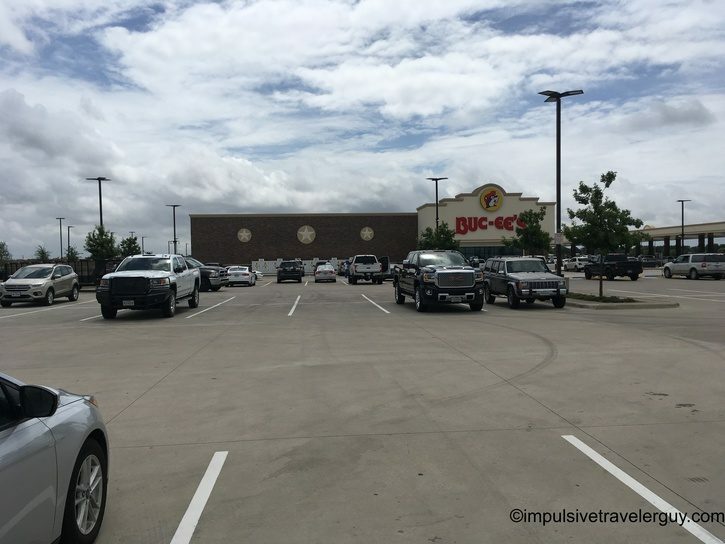 The plan was to visit the remaining seven Buc-ee’s. 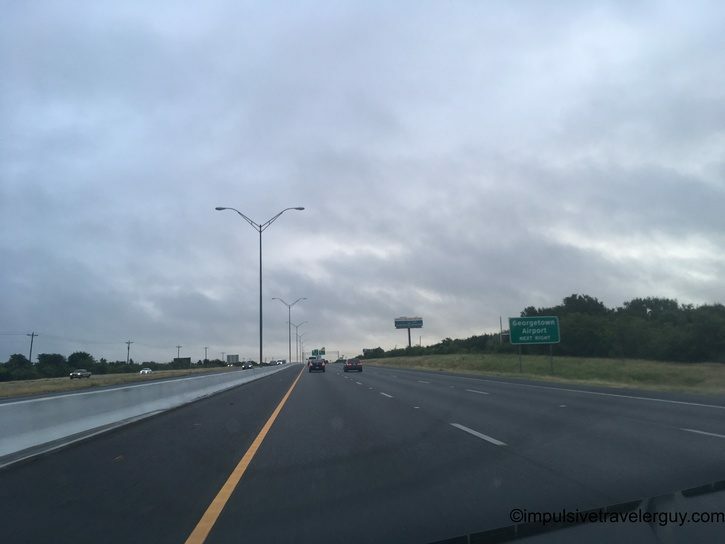 The morning started off cloudy, but I knew it was going clear up and get hot. 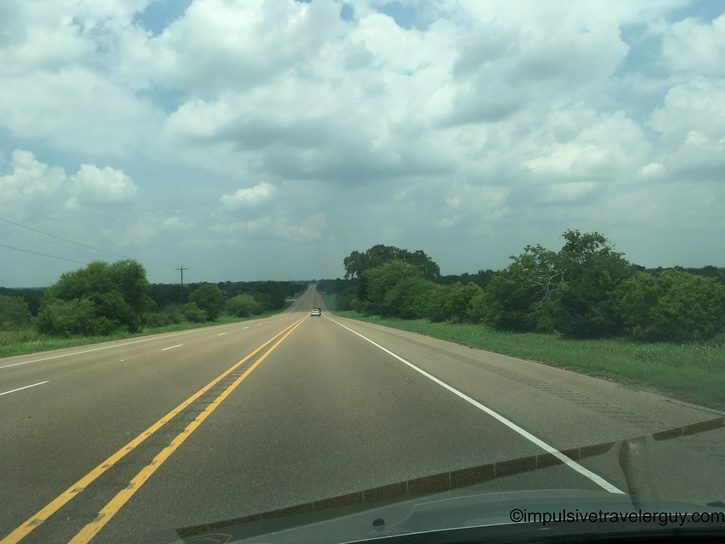 I hit the road and started down Texas 71. 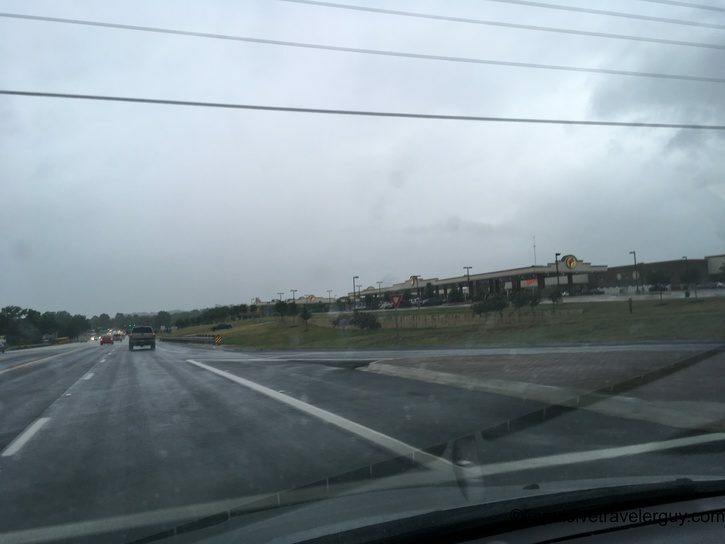 Just like the night before coming to Austin, I went past the Bastrop Buc-ee’s again. My first stop was Eagle Lake. It was time for some gas and breakfast. The next stop was Wharton. 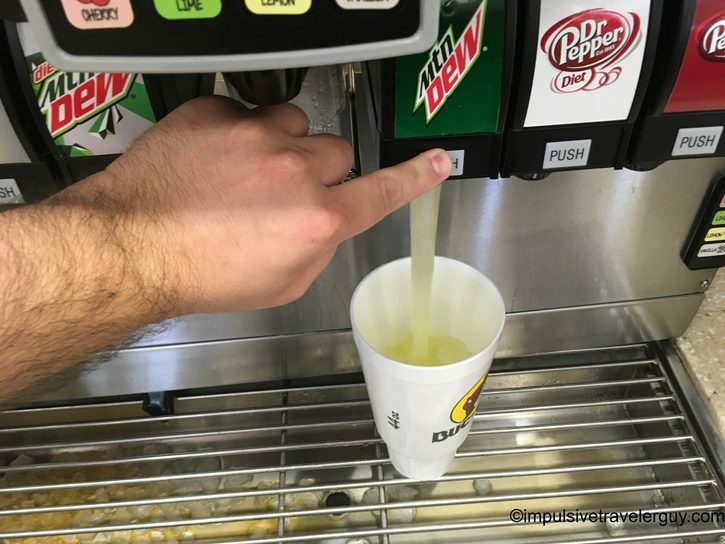 More Mountain Dew to run through my veins. From Wharton was El Campo. 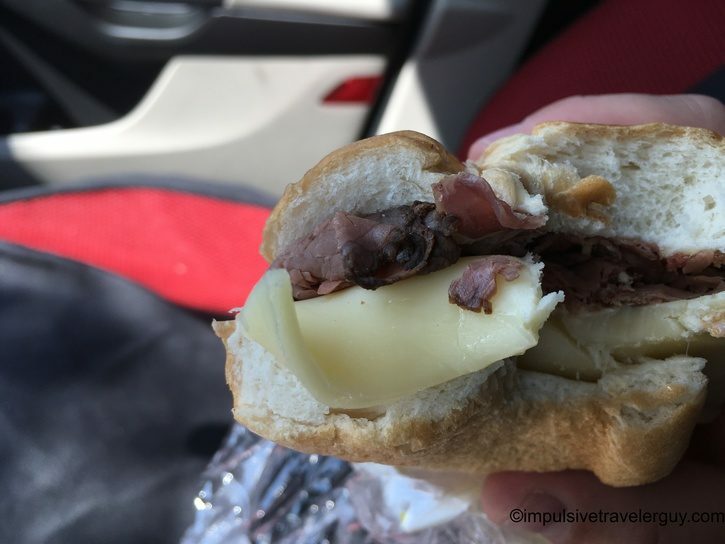 Time for a roast beef sandwich! 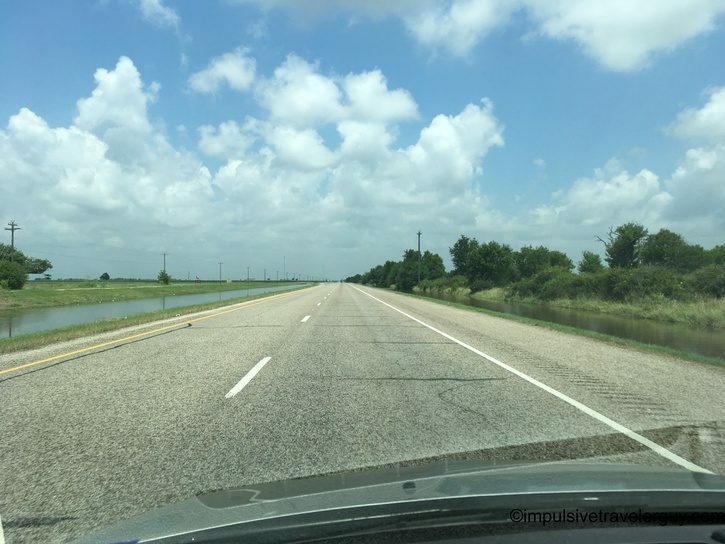 On my way to Port Lavaca, I made a little detour. Well it wasn’t much of a detour since it was right along the way. 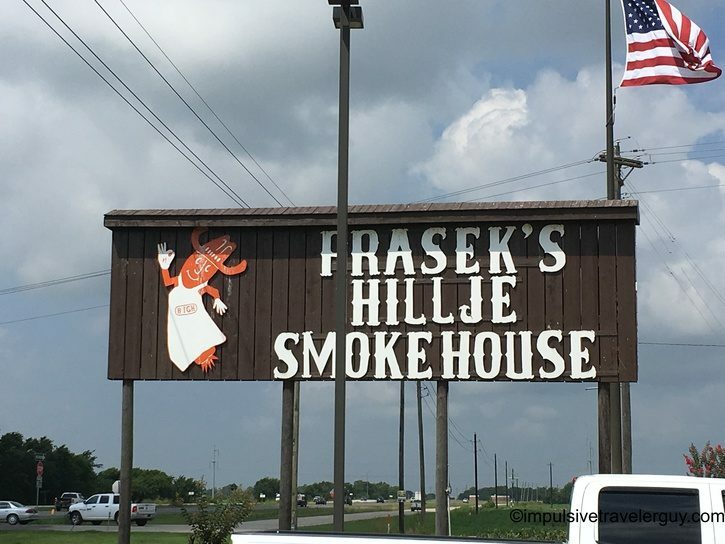 A jerky I love is from Prasek’s. 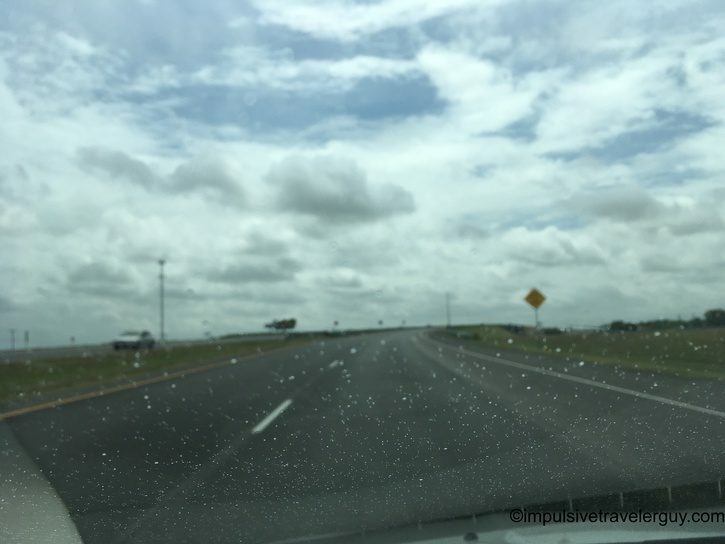 I had it on my list of places to visit and it would be stupid not to stop since it was on the road I was driving. 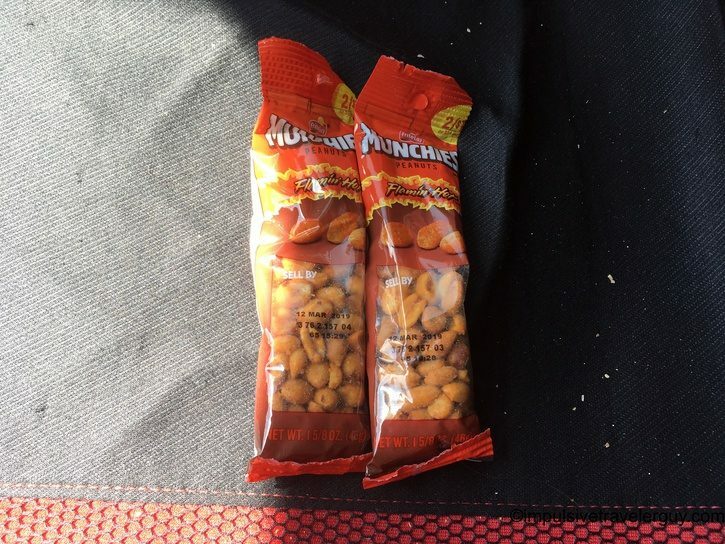 I got some jerky there and headed to the Port Lavaca location to get some spicy peanuts. 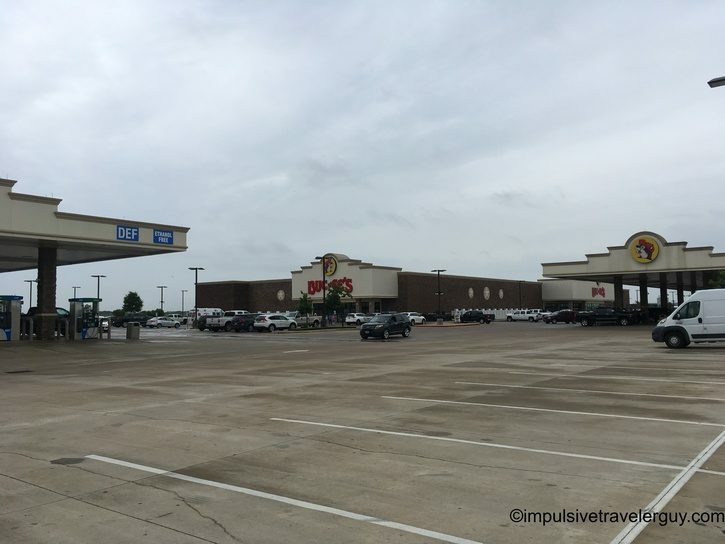 The list of remaining Buc-ee’s was really starting to dwindle. Gonzales was the third to last one to visit. Second to last was Luling. Like Madisonville, this place was insanely packed. It was almost shoulder to shoulder trying to get around! 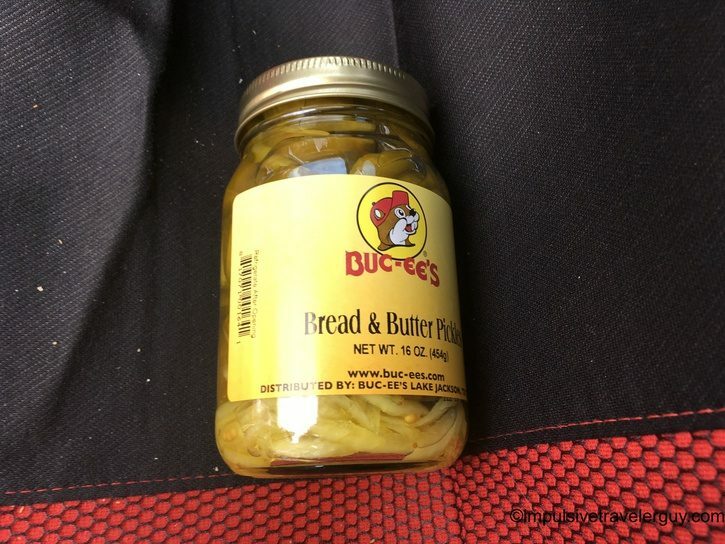 I got some bread and butter pickles. Last but not least was the biggest of them all, New Braunfels! 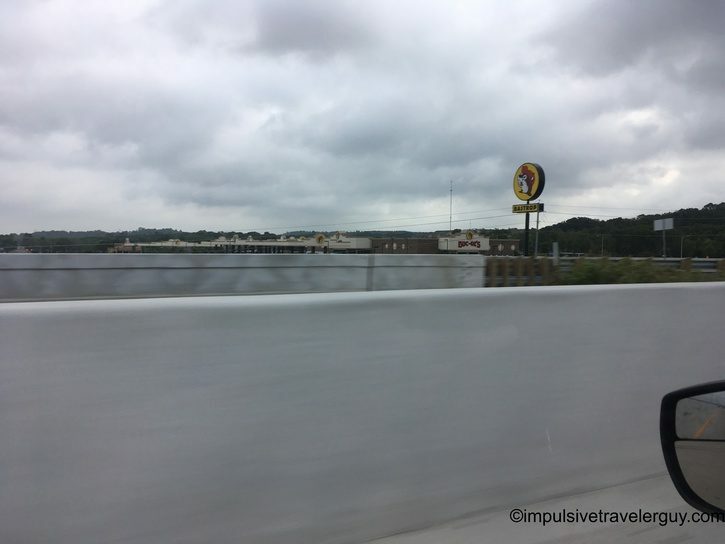 This was the first Buc-ee’s I ever visited and I visit often when I’m headed to San Antonio. I went a bit gung ho with the pictures here. 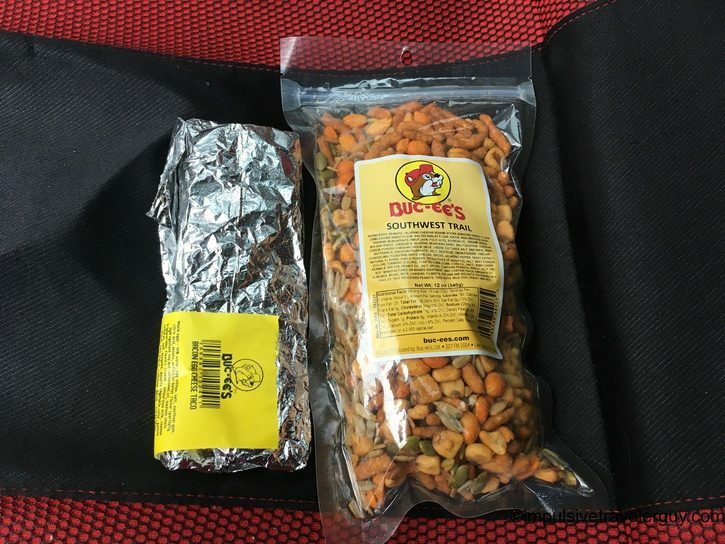 If you wanted to see the depth of Buc-ee’s offerings, the individual blog entry on this location is the one to look at. 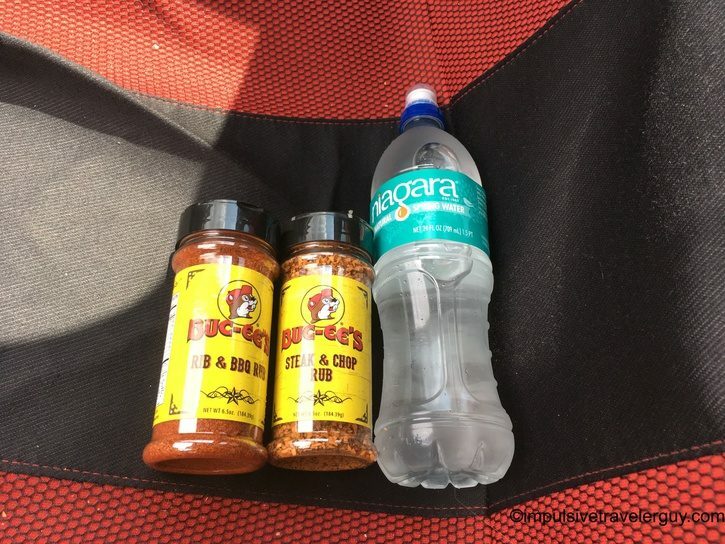 I got a bottle of water, steak & chop seasoning, and rib & BBQ seasoning. 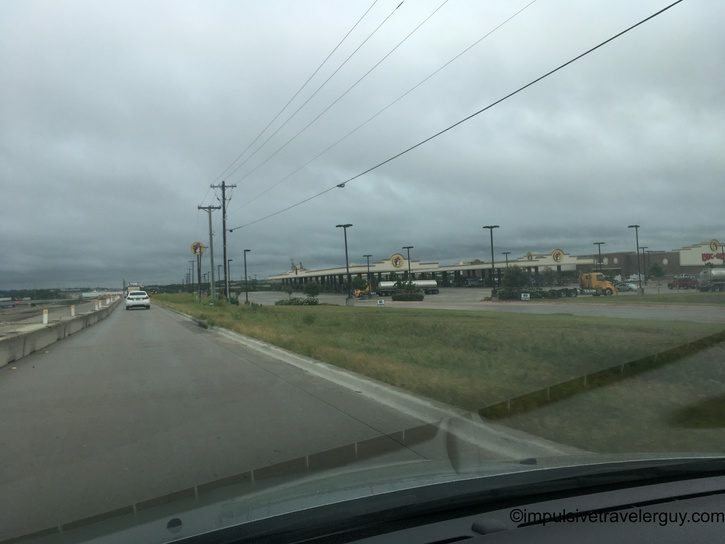 The drive for my final day of Buc-ee Mania was the opposite of the previous days. It started out a bit cloudy, but the clouds cleared fast and it got hot. 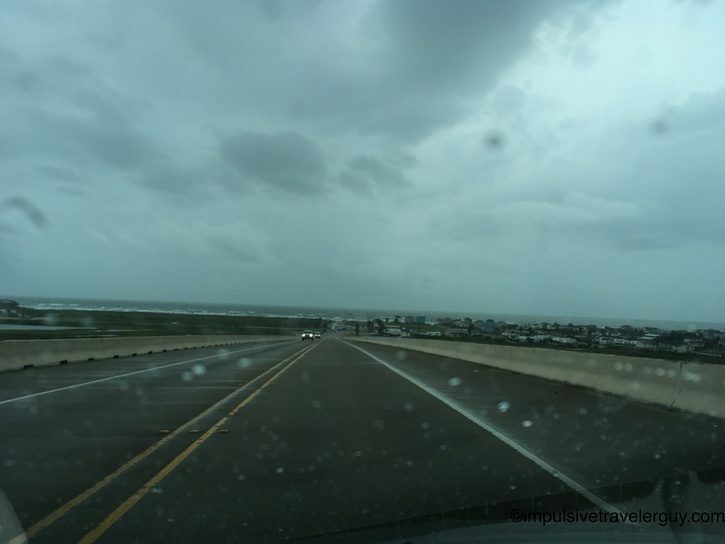 You could still see some water standing from the previous rain and the humidity was awful. In many ways it was nice to get back to Austin and sit in my apartment. I realized that I had put on over 1,600 miles in the last couple days and was accumulating a lot of garbage. 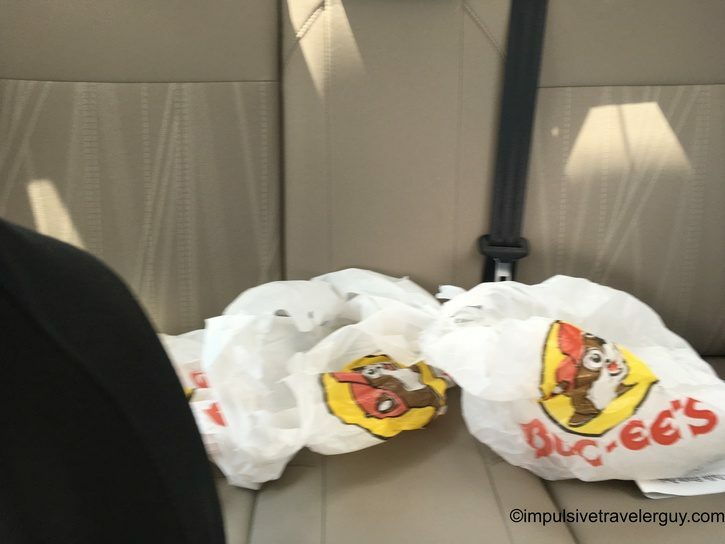 My back seat became littered with Buc-ee’s plastic bags. 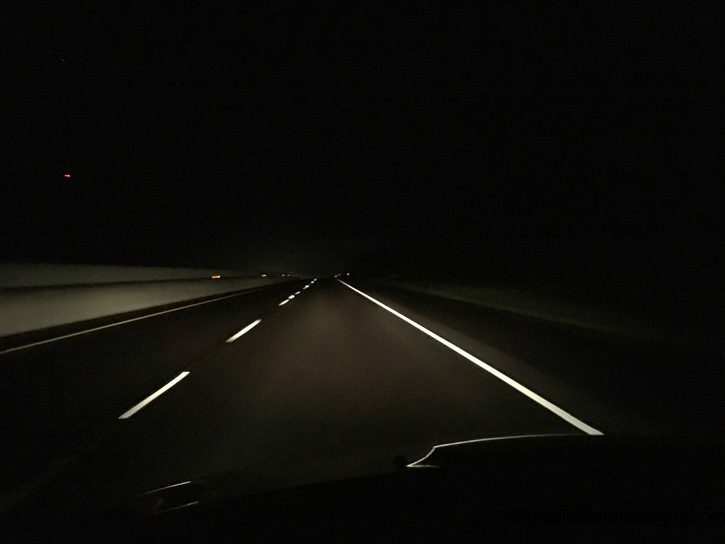 If you’re still reading this, you see it was a long trip especially in the course of three days. 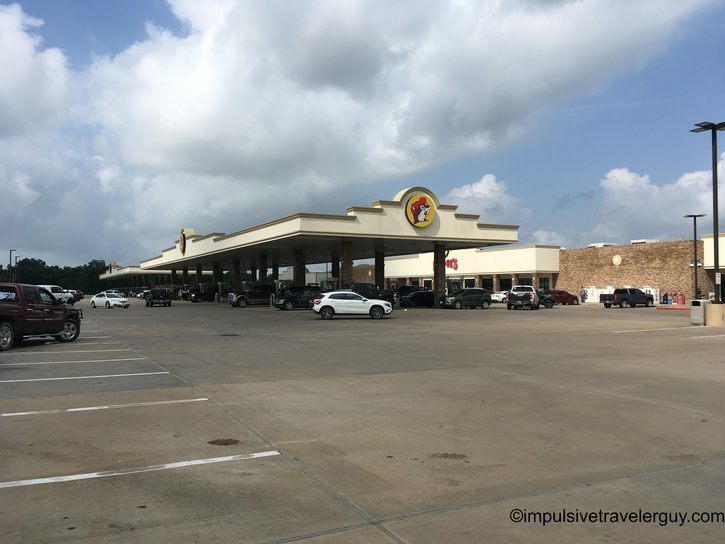 For me it did start to become repetitious, but in many ways it’s because Buc-ee’s holds true to their brand. 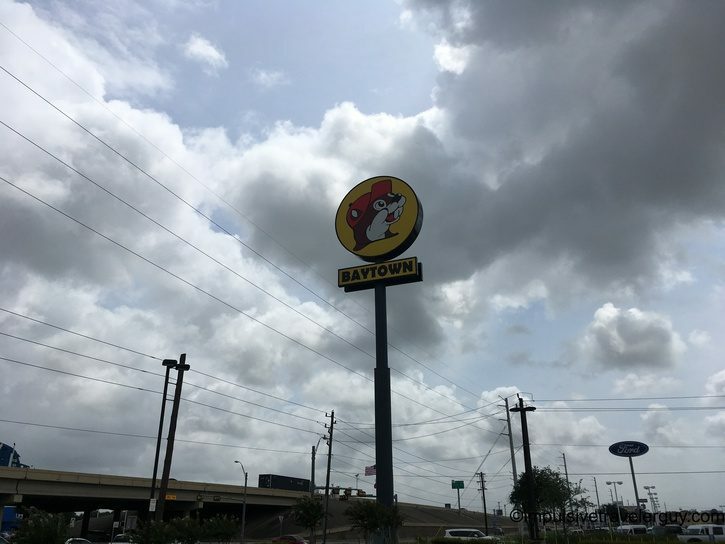 The first part of their brand is what is known as the “Buc-ee’s standard.” They are obsessive about clean bathrooms and it’s one of their main selling points. I can tell you I did not find a single location with a dirty bathroom. The dirtiest I saw was an unflushed urinal. 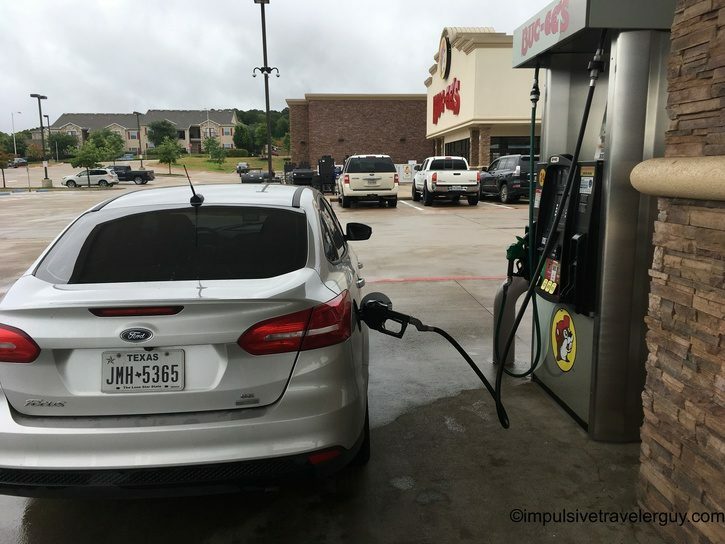 That’s really not Buc-ee’s fault as it is the person who went to the bathroom before me. The workers were constantly cleaning and at travel centers, there was a small army of them. 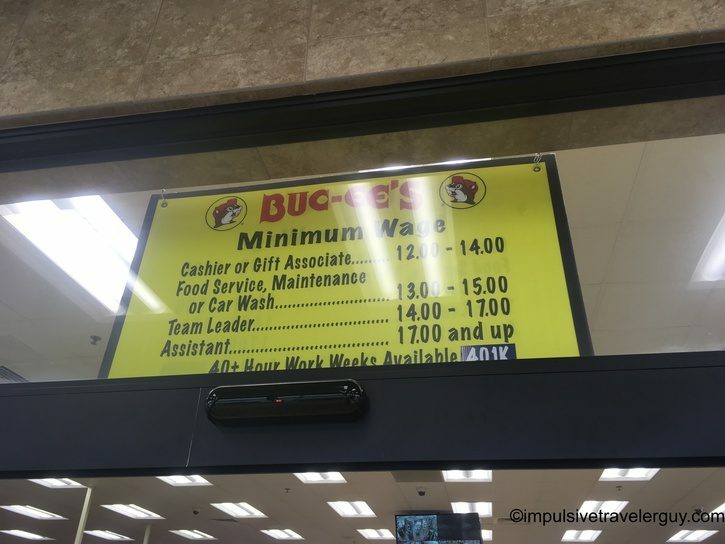 On the topic of workers, Buc-ee’s posts their wages and benefits at every entrance of the building. The wages and benefits are well above what other gas stations pay. This is obviously to attract good talent. It’s clear they attract good talent between the managers who asked if I needed help or the other workers just doing a good job. How could I tell they were doing a good job? It was easy. 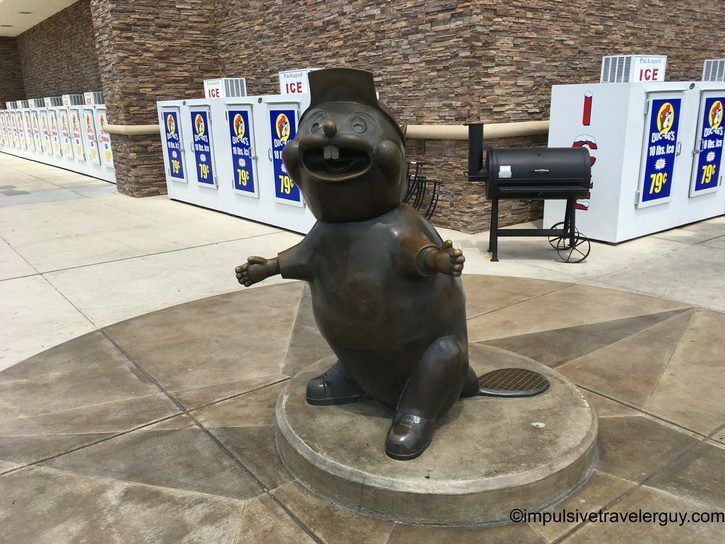 It was rare to see a Buc-ee’s worker idle. They were constantly cleaning and organizing the store. Everything was nice, neat, and organized. The aesthetics of shopping were great. Aesthetics aside, another benefit of this was functionality. This is something I’m more a stickler on. I can’t tell you how many gas stations I’ve been to where I don’t get a receipt from the gas pump. 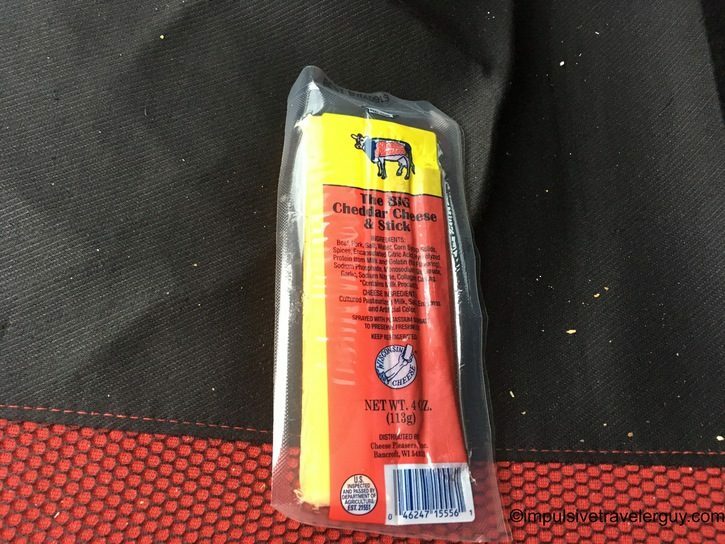 There’s also been countless times I’ve looked for a specific product to only find an empty box. This never happened at Buc-ee’s. Everything was fully functional and made the shopping experience painless. 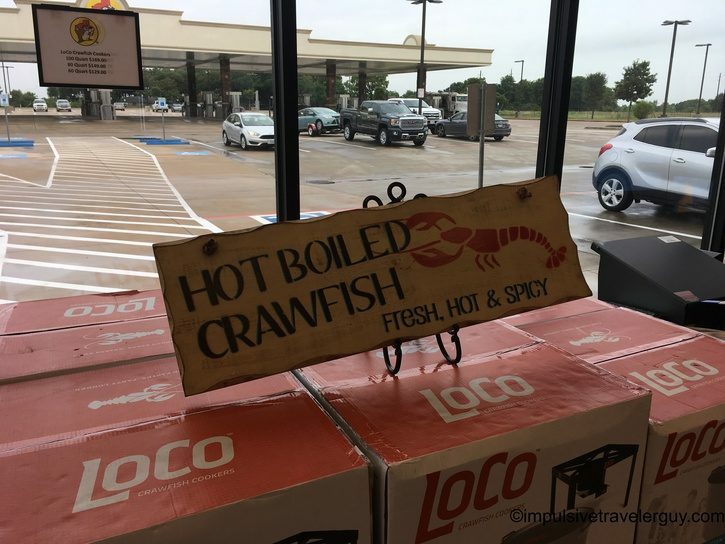 You could tell Buc-ee’s caters to local tastes. 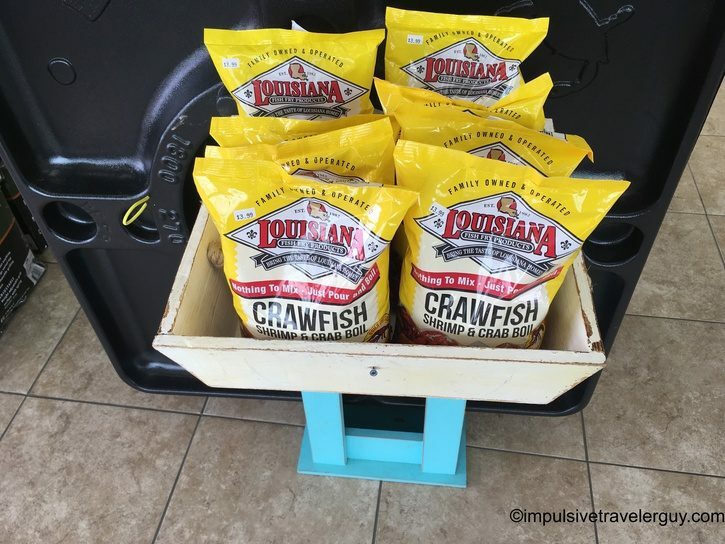 I saw more Cajun products in the East Texas locations. I wonder if I’m the first customer to hit up every single location. 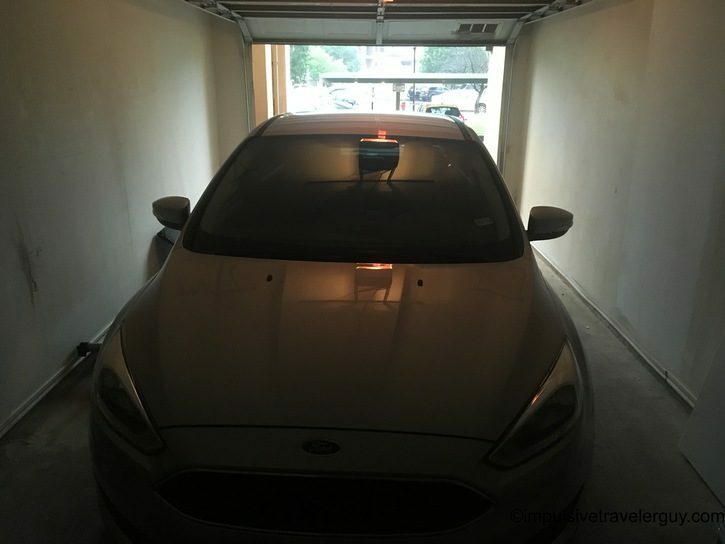 If not, maybe this 1,600 mile trip is the first to do it in only three days. 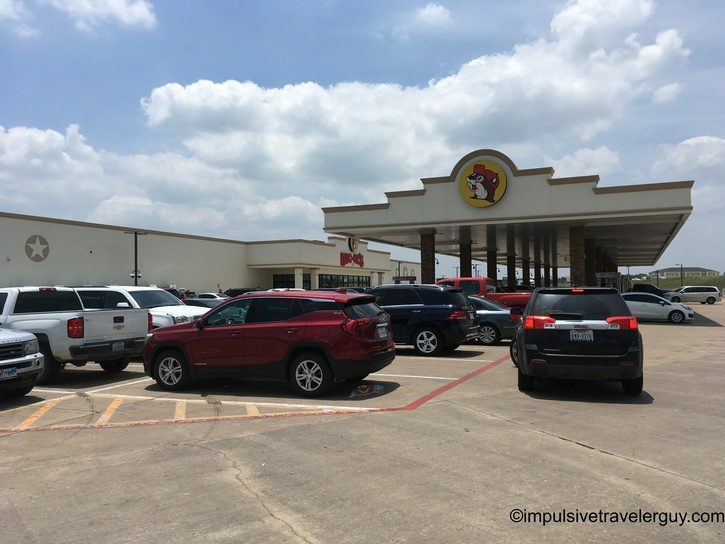 I can tell you it was an interesting experience and I’m still in awe by how Buc-ee’s pulls it off. One thing I do wish is there was a place to sit and eat. 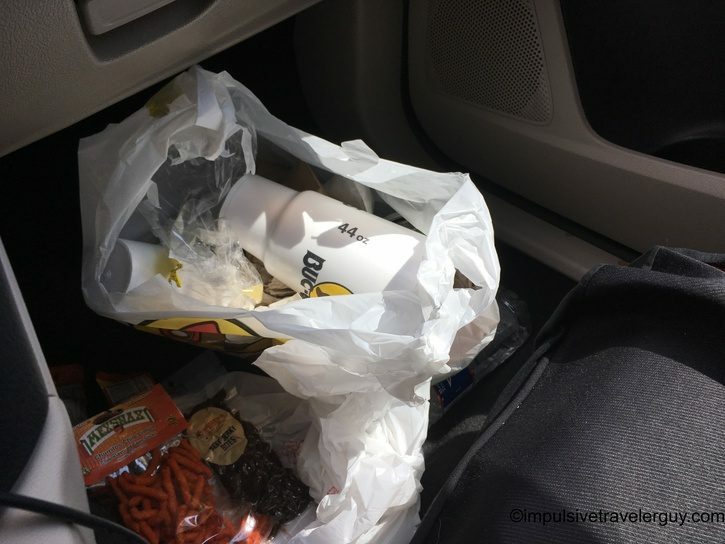 It’s kind of hard to eat messy BBQ in the car and it’s just nice to get out, stretch, and sit down at a table. 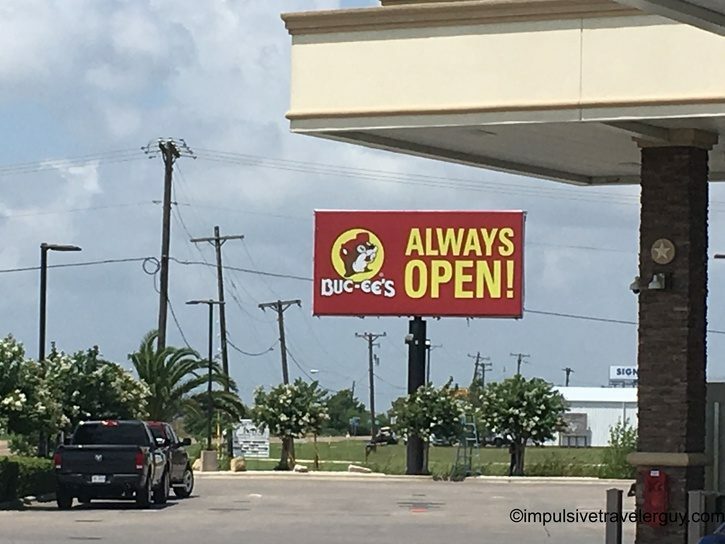 Other than that, I think Buc-ee’s has nailed it! 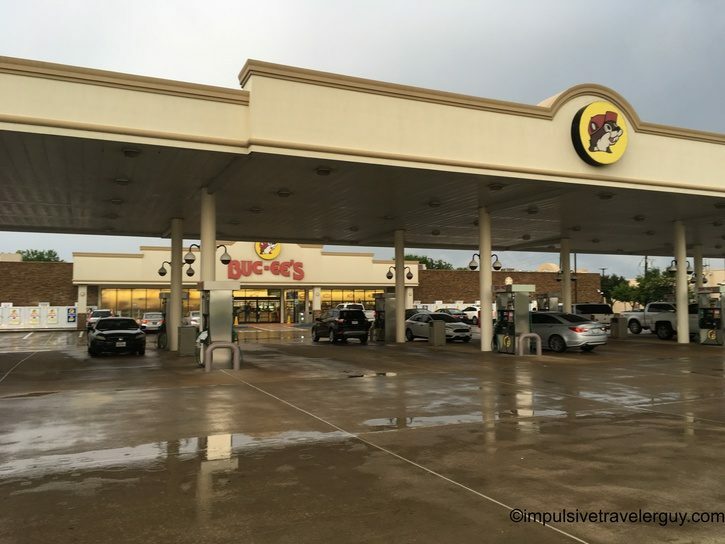 If there’s a Buc-ee’s in the area, it makes a road trip complete by stopping. If you really want, it can be a destination in itself. I recommend visiting one, or if you’re so inclined all 33 like me. 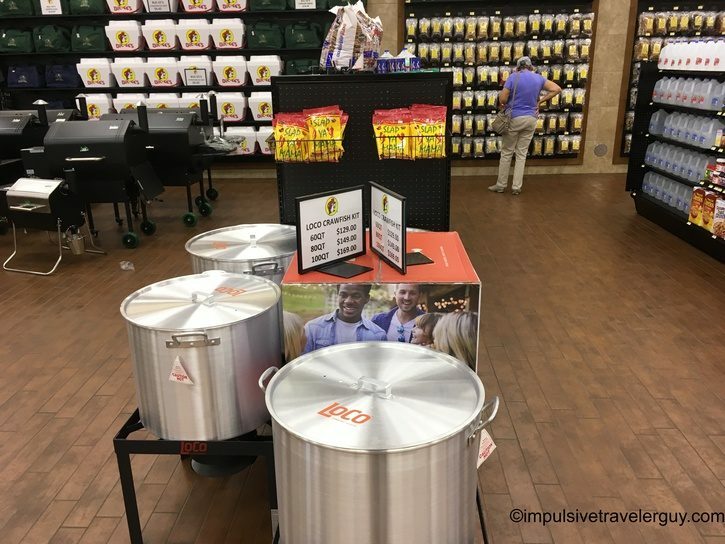 I’m sure you’ll find something (or load up a cart) of some of the cool things Buc-ee’s has to offer!